포토 레지스트 층과 인터믹싱이 일어나지 않고, 포토 레지스트에 비교하여 큰 드라이에칭 속도를 가지는, 반도체장치 제조의 리소그라피 프로세스에 사용되는 하층막을 제공한다. Without the photoresist layer and intermixing it occurs, having a large dry etching rate as compared with the photoresist, and provides lower-layer film used in lithography process for manufacturing semiconductor devices. 구체적으로는, 발포제, 유기재료 및 용제를 포함하거나, 또는, 발포성기를 가지는 폴리머 및 용제를 포함하는, 반도체장치의 제조에 사용되는 다공질 하층막을 형성하기 위한 하층막 형성 조성물. Specifically, a blowing agent, including an organic material and a solvent, or, having an expandable polymer and, the lower the film-forming composition for forming a porous lower layer film is used for manufacturing a semiconductor device comprising a solvent. 이 조성물로 형성되는 하층막은, 그 내부에 공공을 가지는 다공질 구조로 이루어지고, 큰 드라이에칭 속도의 달성이 가능하다. A lower layer formed of a film, porous structure having a public therein formed in the composition, it is possible to achieve a greater dry etching rate. 본 발명은, 반도체 기판과 포토 지스트의 사이에 다공질 하층막을 형성하는 것을 포함하는, 반도체 장치의 제조에 이용되는 포토 레지스트 패턴의 형성방법에 관한 것이다. The present invention relates to a method for forming a photoresist pattern used for manufacturing a semiconductor device comprising forming a porous lower layer film between the semiconductor substrate and a photo registry. 또한, 본 발명은, 반도체 장치의 제조에 이용되는 포토 레지스트 패턴의 형성에 사용되는 다공질 하층막을 형성하기 위한 하층막 형성 조성물에 관한 것이고, 그리고, 이 하층막 형성 조성물을 이용한 다공질 하층막의 형성방법, 및 이 하층막 형성조성물로 형성되는 다공질 하층막에 관한 것이다. The present invention is directed to a lower layer film-forming composition for forming a porous lower layer film is used for forming the photoresist pattern used for manufacturing a semiconductor device, and, a porous lower layer film formation method using the underlayer film forming composition, and a process for the porous lower layer film is formed of the lower layer film composition. 종래부터 반도체 장치의 제조에 있어서, 포토 레지스트를 이용한 리소그라피에 의한 미세가공이 행해지고 있다. Conventionally in the manufacture of a semiconductor device, a fine processing is performed by a lithography using a photo-resist. 이 미세가공은 실리콘 웨이퍼 등의 반도체 기판상에 포토 레지스트의 박막을 형성하고, 그 위에 반도체 디바이스의 패턴이 그려진 마스크 패턴을 통하여 자외선 등의 활성광선을 조사하고, 현상하여, 얻어진 포토 레지스트 패턴을 보호막으로 하여 기판을 에칭처리 함으로써, 기판 표면에 상기 패턴에 대응하는 미세 요철을 형성하는 가공법이다. The fine processing is irradiated with active light such as ultraviolet rays through a mask pattern is a pattern of a semiconductor device drawn to form a thin film of a photoresist on a semiconductor substrate, on it, such as a silicon wafer, and developing the protective film and the resulting photoresist pattern by the etching treatment of the substrate, a processing method for forming the fine unevenness corresponding to the pattern on the substrate surface. 그런데, 근년, 반도체 디바이스의 고집적도화가 진행하고, 사용되는 활성광선도 KrF 액시머 레이저(248nm)로부터 ArF 액시머 레이저(193nm)로 단파장화 되는 경향이다. By the way, in recent years, a tendency that shorter wavelength actinic light which is integrated Drawing of a semiconductor device proceeds, used as from KrF excimer laser (248nm) to ArF excimer laser (193nm). 이것에 수반한 활성광선의 기판으로부터의 난반사나 정상파의 영향이 큰 문제로 되었다. The effect of irregular reflection and standing wave of active light rays from the substrate have been involved in this as a major problem. 여기서, 이 문제를 해결하기 위하여, 포토 레지스트와 기판 사이에 반사방지막(Bottom Anti-Reflective Coating, BARC)를 설치하는 방법이 널리 검토되고 있다. Here, in order to solve this problem, a method of installing the anti-reflection film (Bottom Anti-Reflective Coating, BARC) between the photoresist and the substrate has been widely examined. 이러한 반사방지막으로는, 그 사용의 용이함 등으로 인하여, 흡광성 물질과 고분자 화합물 등으로 이루어진 유기 반사 방지막에 관하여 수많은 검토가 행해지고 있고, 예를 들면, 가교반응기인 히드록실기와 흡광기를 동일분자내에 가지는 아크릴 수지형 반사 방지막이나 가교반응기인 히드록실기와 흡광기를 동일 분자내에 가지는 노보락 수지형 반사 방지막 등을 들 수 있다(예를 들면, 특허문헌 1, 특허문헌 2 참조). The anti-reflection film as is, due to such as ease of use, and number of the review is done with respect to the organic anti-reflection film made of absorptive light-shielding material and a high molecular compound such as, for example, a hydroxyl group and a light absorbing group cross-linking reactor in the same molecule having the like Novo film rock-held reflection having the group a hydroxyl group and a light absorbing anti-reflection coating or an acrylic-held crosslinked reactor in the same molecule (for example, see Patent Document 1, Patent Document 2). 유기 반사 방지막에 요구되는 특성으로는, 빛이나 방사선에 대하여 큰 흡광도를 가지는 것, 포토 레지스트 층과 인터 믹싱이 일어나지 않는 것(포토 레지스트 용제에 불용(不溶)인 것), 가열 소성시에 반사 방지막으로부터 상층 포토 레지스트로의 저분자 물질의 확산이 일어나지 않는 것, 포토 레지스트에 비하여 큰 드라이 에칭 속도를 가지는 것 등이 있다(예를 들면, 비특허문헌 1, 비특허문헌 2, 비특허문헌 3 참조). The properties required for the organic antireflection film, having a large absorbance to light or radiation, to the photoresist layer and the intermixing does not occur (that is insoluble (不溶) in a photoresist solvent), an antireflection film when heated and baked and the like to the diffusion of low molecular substances in the upper layer photoresist does not occur from those which have a larger dry etching rate than the photoresist (see, for example, non-Patent Document 1, non-Patent Document 2, non-Patent Document 3) . 또한, 근년, 반도체장치의 패턴 룰의 미세화에 따라 밝혀진 배선지연의 문제를 해결하기 위해, 배선재료로서 구리를 사용하는 검토가 행해지고 있다. In order to solve the problem of the wiring delay is identified in accordance with the miniaturization of recent years, a pattern rule of semiconductor devices, have been made to examine using copper as a wiring material. 그리고, 그것과 함께 반도체기판으로의 배선형성 방법으로서 듀얼 다마신 프로세스의 검토가 행해지고 있다. And, it is done with it, the examination of a dual damascene process as a wiring forming method for a semiconductor substrate. 듀얼 다마신 프로세스는 비어 홀이 형성되고, 큰 아스팩트 (aspect) 비를 가지는 기판에 대하여 반사 방지막이 형성되는 것으로 이루어진다. Dual damascene process are made to be via hole is formed, the anti-reflection film formed with the substrate having a large asbestos fact (aspect) ratio. 그 때문에, 이 프로세스에 사용되는 반사 방지막에 대해서는, 홀을 극간(隙間) 없이 충전할 수 있는 매입특성이나, 기판 표면에 평탄한 막이 형성되도록 되는 평탄화 특성이 요구되고 있다. Therefore, the planarization characteristics to form a film on the flat pieces or characteristic, the substrate surface can for the anti-reflective coating used in this process, and to charge the hole with no gap (隙間) has been desired. 그러나, 유기계 반사 방지막용 재료를 큰 아스팩트 비를 가지는 기판에 적용하는 것은 어렵고, 근년, 매립특성이나 평탄화특성에 중점을 둔 재료가 개발되어 오고 있었다(예를 들면, 특허문헌 3, 특허문헌 4, 특허문헌 5, 특허문헌 6 참조). However, had been to apply an organic anti-reflective coating material for a substrate having a large asbestos fact non-material with a focus on, in recent years, filling characteristics and the planarization characteristics hardly been developed (e.g., Patent Document 3, Patent Document 4 , refer to Patent Document 5, Patent Document 6). 또한, 반도체 등의 디바이스 제조에 있어서, 유전체층에 의한 포토 레지스트 층의 포이즈닝 효과를 감소시키기 위해, 가교가능한 폴리머 등을 포함하는 조성물로 형성되는 배리어 층을, 유전체층과 포토레지스트 층의 사이에 설치한다고 하는 방법이 개시되어 있다(예를 들면, 특허문헌 7 참조). Further, in the device production such as semiconductor, for reducing the poisoning effect of the photoresist layer by a dielectric layer, the cross-linking that installing a barrier layer formed from a composition comprising the possible polymer or the like, between the dielectric layer and the photoresist layer there is a method is disclosed (for example, see Patent Document 7). 이러하듯이, 근년의 반도체 장치의 제조에는, 반사 방지 효과를 시작으로, 여러가지 효과를 달성하기 위해, 반도체 기판과 포토 레지스트의 사이, 즉 포토레지스트의 하층으로, 유기화합물을 포함하는 조성물로 형성된 유기계의 하층막이 배치되도록 되어 왔다. In the production of this, as these, in recent years, semiconductor devices, starting with the anti-reflection effect, to achieve a variety of effects, as the lower layer between the semiconductor substrate and the photoresist, i.e., photoresist, organic formed from the composition containing an organic compound of the lower layer film it has been so placed. 그런데, 그러한 하층막은, 포토 레지스트와 비교하여 큰 드라이 에칭 속도를 가질 필요가 있다. By the way, as compared with such a lower layer film, a photoresist is required to have a greater dry etching rate. 반도체 기판의 가공은, 패턴이 형성된 포토 레지스트를 보호막으로 드라이 에칭에 의해 이루어지지만, 그 때, 기판에 앞서, 우선, 포토 레지스트를 보호막으로 드라이 에칭에 의한 하층막의 제거가 행해진다. Processing of a semiconductor substrate, but the pattern is made by dry etching the photoresist to a protective film, then, prior to the substrate, the first, the photoresist protective film is carried out a lower layer film is removed by dry etching. 그 때문에, 하층막의 제거시에도 포토 레지스트 막두께의 감소가 일어난다. Therefore, even when the lower layer film removal occurs a decrease in photoresist film thickness. 그리고, 하층막의 제거 에 긴 시간을 요하는 것이라면, 포토 레지스트 막두께의 감소량이 크게 되고, 기판의 가공에 필요한 막두께를 확보할 수 없게 된다고 하는 문제가 발생한다. And, if required a long time on the lower layer film is removed, and a photoresist film with a thickness reduction amount greatly, there arises a problem that can not be ensured a thickness necessary for the processing of the substrate. 특히, 근년, 포토 레지스트 패턴의 선폭의 미세화에 수반하여, 포토 레지스트의 도괴(倒壞) 등을 방지하기 위해 포토 레지스트의 박막화가 요망되어 지고 있다. In particular, there is a thinning of the photoresist being desirable to prevent late years, along with the miniaturization of the line width of the photoresist pattern collapse of a photoresist (倒 壞) and the like. 그 때문에, 종래보다도 많이, 단시간으로 제거가능한 하층막, 즉, 큰 드라이 에칭 속도를 가지는 하층막이 요구되어지고 있다. For this reason, much more than the prior art, removing the lower layer film as possible in a short time, that is, being the lower layer film is required having a large dry etching rate. 특허문헌 6 : 국제공개 제02/05035호 팜플렛 Patent Document 6: International Publication No. 02/05035 Pamphlet No. 이러한 현상에 착안하여 본발명자등은 예의 연구를 행한 결과, 하층막을 공공(空孔)을 가진 막, 즉, 다공질 하층막으로 함으로써, 그, 드라이 에칭에 의한 제거 속도를 높일 수가 있다는 것을 도출하고, 본발명을 완성한 것이다. In view of the phenomenon the present inventors is result of the intensive studies, the film with lower film public (空 孔), that is, by the porous lower layer film, and, it derives that can increase the removal rate by dry etching, to complete the present invention. 즉, 본 발명의 목적은, 큰 드라이 에칭 속도를 가지는 다공질 하층막을 반도체 기판상에 형성하는 것을 포함하는, 반도체 장치의 제조에 이용되는 포토 레지스트 패턴의 형성방법을 제공하는 것이다. That is, an object of the present invention to provide a method for forming a photoresist pattern using the porous lower layer film having a larger dry etching rate in the manufacture of semiconductor device, comprising: forming on a semiconductor substrate. 또한, 본 발명의 목적은, 다공질 하층막의 형성에 사용되는 하층막형성 조성물을 제공하는 것에 있고, 또한, 이 조성물로 형성되는 다공질 하층막, 및 이 조성물을 이용한 다공질 하층막의 형성방법을 제공하는 것에 있다. It is also an object of the invention, and to provide an underlayer film forming composition used for the porous lower layer film formation, and also, the porous lower layer film formed of the composition, and to provide a porous lower layer film formation method using the composition have. 제 13 관점으로서, 제 4 관점 내지 제 12 관점 중 어느 하나에 기재된 하층막 형성 조성물을 기판 위에 도포하고, 가열하여 다공질 하층막을 형성하는 공정, 이 다공질 하층막에 포토 레지스트 층을 형성하는 공정, 상기 다공질 하층막과 상기 포토 레지스트로 피복된 반도체 기판을 노광하는 공정, 상기 노광후에 상기 포토 레지스트를 현상하는 공정, 및 상기 포토 레지스트가 현상제거된 부분의 다공질 하층막을 에칭에 의해 제거하는 공정,을 포함하는 반도체 장치의 제조에 이용되는 포토 레지스트 패턴의 형성방법, 이다. Claim 13 as an aspect, a fourth aspect to twelfth aspect in which a step of a lower layer film coating forming composition on a substrate described in, and heated to form a porous lower layer film, a step of forming a photoresist layer on the porous lower layer film, wherein including after the porous lower layer and the photoresist process, the exposure for exposing the semiconductor substrate coated with a step, which step, and removed by etching the porous lower layer film of the photoresist is removed, the developing part for developing the photoresist a method for forming a photoresist pattern used for manufacturing a semiconductor device, which. 본 발명은, 이러한 구성에 의해, 포토 레지스트와 인터 믹싱을 일으키지 않고, 큰 드라이 에칭 속도를 가지는 다공질 하층막을 제공할 수 있다. The present invention, by such a configuration, without causing intermixing with the photoresist, it is possible to provide the porous lower layer film having a larger dry etching rate. 얻어진 다공질 하층막은, 드라이 에칭 프로세스에서 신속한 제거가 가능하기 때문에, 반도체 기판 가공시에 보호막으로 기능하는 포토 레지스트의 막두께의 감소량을 저감하는 것이 가능하게 된다. Since it is possible that the obtained porous lower layer film, rapid removal from the dry etching process, to reduce the amount of reduction in film thickness of a photoresist which functions as a protective film during semiconductor substrate processing it can be realized. 또한, 본 발명의 방법에 의해, 초기의 포토 레지스트의 막두께가 적은 경우에도, 반도체 기판의 가공에 필요한, 패턴화된 포토 레지스트 및 하층막으로 이루어진 보호막의 확보가 가능하게 된다. Further, by the method of the present invention, even if the thickness of the initial photoresist small, required for processing of a semiconductor substrate, the patterned photoresist and the securing of a protective film consisting of a lower layer film is made possible. 도 1은, 본 발명의 다공질 하층막을 사용한 제조 프로세스에서의 반도체 기판의 포토 레지스트 패턴의 단면구조를 나타내는 그림이고, 도면 중의 부호 (11)은 반도체 기판을 나타내고, (12)는 다공질 하층막을 나타내며, (13)은 포토 레지스트 를 나타내고, (14)는 다공질이 아닌 하층막을 나타내며, (15), (16)은 포토 레지스트의 막두께의 감소부분을 나타낸다. 1 is an illustration showing a cross-sectional structure of the photoresist pattern on the semiconductor substrate in the production with the porous lower layer film is the process of the present invention, the reference numeral 11 in denotes a semiconductor substrate, and 12 denotes the porous lower layer film, 13 represents a photo resist, 14 denotes the lower layer film is non-porous, 15, and 16 indicates a decrease of the film thickness of the photoresist. 본 발명은, 공공(空孔)을 가지는 하층막, 즉, 다공질 하층막이 큰 에칭 속도를 가지는 것을 발견한 것에 기초하고 있다. The present invention, the lower layer film having a public (空 孔), that is, is based on the discovery that the porous lower layer film having a large etching rate. 본 발명은, 다공질 하층막을 사용한 반도체 장치의 제조에 사용되는 포토 레지스트 패턴의 형성방법, 다공질 하층막의 형성에 사용되는 하층막 형성 조성물, 및, 이 하층막 형성 조성물을 이용한 다공질 하층막의 형성방법을 제공하는 것에 관한 것이다. The present invention provides a porous lower layer to form a photoresist pattern used for manufacturing a semiconductor device using a film method, the lower layer film composition used for the porous lower layer film formation, and, the porous lower layer film formation method using the underlayer film forming composition relate to. 본 발명의 포토 레지스트 패턴의 형성방법에 있어서는, 반도체 기판상에 다공질 하층막이 형성된 후, 그 다공질 하층막 상에 포토 레지스트 칭이 형성된다. In the method of forming the photoresist pattern of the present invention, after the porous lower layer film formed on a semiconductor substrate, a photoresist is formed on the porous lower layer referred membrane. 여기서 다공질 하층막의 막두께로서는, 예를 들면 30~2000nm 이고, 또는 30~1500nm 이며, 또한, 예를 들면, 50~1500nm 이다. Wherein a lower layer and as the porous film has a thickness, for example 30 ~ 2000nm, or 30 ~ 1500nm, also, for example, 50 ~ 1500nm. 포토 레지스트 층의 막두께로서는, 예를 들면 50~10000nm 이고, 또는 50~8000nm 이며, 또한, 예를 들면, 100~5000nm 이다. As the film thickness of the photoresist layer, for example a 50 ~ 10000nm and, or 50 ~ 8000nm, also, for example, a 100 ~ 5000nm. 다공질 하층막에 있어서, 그 막에 점하는 공공의 비율로서는, 그 체적으로서, 예를 들면, 5~80% 이고, 또는, 10~50% 이며, 또한, 10~30% 이다. In the porous lower layer film, as its volume as the ratio of the vacancy point on the film, for an example, from 5 to 80%, or 10-50%, and, 10 to 30%. 공공의 비율이 이것보다 크게 되면, 균일한 막의 형성이 곤란하게 된다. When the proportion of the public is greater than this, it is formed a uniform film is difficult. 또한, 공공의 크기로서는, 공공 직경으로, 예를 들면 1~500nm 이고, 또는, 1~50nm이다. Further, as the size of the public, and the public in diameter, for example 1 ~ 500nm, or a 1 ~ 50nm. 공공이 이것보다 크게 되면, 상층의 포토 레지스트의 패턴 형성에 악영향을 미치게 된다. If the public is made larger than this, and adversely affect the pattern formation of the upper layer photoresist. 다음으로, 다공질 하층막과 포토 레지스트 층으로 피복된 반도체 기판이, 미 리 설정된 마스크를 통하여, i선, KrF 액시머 레이저, ArF 액시머 레이저 등의 빛으로 노광된다. Next, the semiconductor substrate coated with a porous lower layer film and the photoresist layer through the non-re-set mask, is exposed to i-line, KrF excimer laser, ArF excimer laser light such as liquid. 노광후, 필요에 띠라 노광후 가열(PEB, post exposure bake)을 행한다. After the exposure, post-exposure is carried out ttira necessary heating (PEB, post exposure bake). 그리고, 알칼리성 수용액 등을 사용한 현상에 의해, 설정된 패턴에 따른 포토 레지스트가 부분적으로 제거된다(도 1의 (A)). Then, by development using an alkaline aqueous solution or the like, the photoresist according to a set pattern it is partially removed (Fig. 1 (A)). 도 1의 (A)에서 (11)은 반도체 기판, (12)는 다공질 하층막, (13)은 패턴화된 포토 레지스트,이다. Also in 1 (A) (11) is a semiconductor substrate, 12 is porous lower layer film, 13 is a patterned photoresist. 또한, 도 1의 (B)는 다공질이 아닌 하층막 (14)를 사용하여, 동일한 공정에 의해 형성된 포토 레지스트를 나타내는 도면이다. Also, (B) of Fig. 1 is a view using the lower layer film 14, a non-porous, showing a photoresist formed by the same process. 이어서, 포토 레지스트가 제거된 부분의 하층막을 에칭에 의해 제거하고, 반도체 기판을 노출시킨다(도 1의 (C) 및 (D)는, (A) 및 (B)에 대응하여, 반도체 기판이 부분적으로 노출한 상태를 각각 나타낸다). Then, the photoresist is removed by the lower layer film is etched in the removed portion, to expose the semiconductor substrate ((C) and (D) of Fig. 1, in response to (A) and (B), the semiconductor substrate is partially It shows an exposed state, respectively). 그 후, 패턴화된 포토 레지스트 및 하층막을 보호막으로 하여, 에칭에 의해 반도체 기판이 가공된다. Then, the patterned photoresist film and the lower protective film, the semiconductor substrate is processed by etching. 그 때문에, 반도체 기판의 가공을 행하기에 충분한 보호막, 즉, 포토 레지스트의 두께가 필요하게 된다. Therefore, a sufficient thickness of the protective film, i.e., a photoresist is required to carry out the processing of a semiconductor substrate. 그런데, 하층막을 제거할 때, 하층막만이 아니고 포토 레지스트도 에칭되고, 그 막두께가 감소한다. However, when removing the lower layer film, not only the lower layer film photoresist is also etched, a decrease in the film thickness. 그 때문에, 하층막의 에칭에 의한 제거에 긴 시간을 필요로 하면, 포토 레지스트의 막두께 감소량이 크게 되고, 기판가공에 필요한 포토 레지스트의 막두께의 확보가 곤란하게 된다. Therefore, if it requires long time to remove by etching the lower layer film, and the film thickness loss of photoresist significantly, the securing of the film thickness of photoresist needed for substrate processing is difficult. 본 발명에서 사용되는 하층막은 공공을 가지는 막, 즉 다공질 하층막이기 때문에, 에칭에 의해 제거되는 속도가, 다공질이 아닌 하층막에 비하여 큰 것이다. Since the present invention the lower layer film is a film, that is, the porous lower layer film having a public as used, the rate at which removal by means of etching, is larger than the lower layer film non-porous. 그 때문에, 하층막 제거에 소요되는 시간이 단시간으로 되고, 그 결과, 포토 레지 스트의 막두께 감소량을 억제할 수 있다. Therefore, the time required for removing the lower layer film and in a short time, can be suppressed As a result, the decrease in the film thickness photoresist host. 도 1의 (A)에서 (C)로의 공정에서의 포토 레지스트의 막두께 감소량 (15)는, (B)에서 (D)로의 공정에서의 포토 레지스트의 막두께 감소량 (16)에 비하여 적게 된다. FIG step picture film thickness reduction (15) of the resist in to in 1 (A) (C) is less than that, (B) Process picture film thickness reduction (16) of the resist in to in (D). 본 발명에 의하면, 하층막 제거에 수반한 포토 레지스트 막두께의 감소량이 적게 되기 때문에, 반도체 기판의 가공에 필요한 막두께를 가지는 패턴화된 포토 레지스트의 형성이 용이하게 된다. According to the present invention, since the photoresist film is less reduction in the thickness it involves removing the lower layer film, the formation of the patterned photoresist with a film thickness required for the processing of a semiconductor substrate is facilitated. 포토 레지스트의 초기의 막두께를 큰 것으로 하는 것은, 애스팩트 비(높이(막두께)/폭(선폭))을 크게 하게 된다. Of the photoresist to be the initial film thickness is large, thereby increasing the aspect ratio (height (film thickness) / width (line width)). 그러나, 애스팩트 비가 크게 됨으로써, 포토 레지스트 현상시의 패턴 무너짐의 증가를 초래하는 등, 불리한 점이 많아, 초기의 포토 레지스트의 막두께를 크게 하는 것은 한계가 있다. However, the fact being astro ratio is larger, such as to result in an increase of the pattern collapse upon photoresist development, many disadvantages, it is not to increase the thickness of the initial photoresist limits. 특히, 패턴 사이즈의 미세화에 수반하여, 포토 레지스트의 초기의 막두께는 작게 되는 경향이 있다. In particular, along with the miniaturization of the pattern size, the initial film thickness of the photoresist it tends to be small. 본 발명의 방법에 의하면, 이러한 상황에서도, 반도체 기판의 가공에 필요한 패턴화된 포토 레지스트 막두께의 확보가 용이하게 된다. According to the method of the present invention, it is in this situation, the need to facilitate processing the patterned photoresist film to secure the thickness of the semiconductor substrate. 본 발명에서 사용되는 반도체 기판에는 특히 제한은 없고, 범용되는 것을 사용할 수 있다. A semiconductor substrate used in the present invention can be used it is not particularly limited and generally used. 예를 들면, 실리콘/이산화실리콘 피복기판, 실리콘 나이트라이드 기판, 저유전율 재료(low-k 재료) 피복기판 등이 사용된다. For example, such as silicon / silicon dioxide coated substrate, silicon nitride substrate, a low-dielectric constant material (low-k material) coated substrate is used. 본 발명에서, 다공질 하층막 층의 상층에 도포, 형성되는 포토 레지스트로서는 특별한 제한은 없고, 범용되고 있는 네가티브형 포토 레지스트, 포지티브형 포토 레지스트중 어느 것도 사용할 수 있다. In the present invention, applied to the upper layer of the porous lower layer film layer, no particular limitation as the photoresist is formed may be any of not, and a general purpose negative type photoresist, a positive photoresist, which also. 예를 들면, 노보락 수지와 1,2-나프토퀴논디아지드술폰산 에스테르로 이루어진 포지티브형 포토 레지스트, 산에 의해 분 해하여 알칼리 용해속도를 상승시키는 기를 가지는 바인더와 광산 발생제로 이루어진 화학 증폭형 포토 레지스트, 산에 의해 분해하여 포토 레지스트의 알칼리 용해속도를 상승시키는 저분자 화합물과 알칼리 가용성 바인더와 광산 발생제로 이루어진 화학증폭형 포토 레지스트, 산에 의해 분해하여 알칼리 용해속도를 상승시키는 기를 가지는 바인더와 산에 의해 분해하여 포토 레지스트의 알칼리 용해속도를 상승시키는 저분자화합물과 광산발생제로 이루어진 화학증폭형 포토 레지스트 등이 있고, 예를 들면, 시프레-사 제조 상품명 APEX-E, 스미토모화학공업(주) 제조 상품명 PAR710, 신-에쓰 화학공업(주) 제조 상품명 SEPR430 등을 들 For example, a novolak resin and 1,2-naphthoquinonediazide positive-type photoresist made of a sulfonic acid ester, a chemical amplification consisting of a binder and a photo-acid generating agent that has the to-minute by the acid groups to raise the alkali dissolving rate type photo resist, to the binder and the acid having a group which decomposes by the acid by decomposing by the alkali dissolution rate of the photoresist to the low molecular weight compound and an alkali-soluble binder and a chemically amplified photoresist, acid consisting generators mine for increasing increases the alkali dissolution rate chemical amplification consisting of low molecular weight compound and a photo-acid generating agent to decompose and increase the alkali dissolution rate of the photoresist by type photosensor, and the resist or the like, for example, sipeure-manufactured trade name: APEX-E, manufactured by Sumitomo chemical Co., Ltd. trade name PAR710 and the like-Etsu chemical Co., Ltd. trade name SEPR430 -, new 수 있다. Can. 포토 레지스트의 현상액으로서는, 범용되는 현상액을 사용할 수 있다. As the developing solution of the photoresist may be used which is a general-purpose developer. 예를 들면, 테트라메틸암모늄히드록시드 수용액 등의 2.0%~3.0%의 알칼리 수용액이 사용된다. For example, 2.0% - 3.0% of an aqueous alkaline solution such as an aqueous tetramethylammonium hydroxide solution is used. 본 발명에서, 다공질 하층막은 에칭에 의해 제거된다. In the present invention, is removed by the porous lower layer film is etched. 에칭은 테트라플루오로메탄, 퍼플루오로시클로부탄(C 4 F 8 ), 퍼플루오로프로판(C 3 F 8 ), 트리플루오로메탄, 일산화탄소, 아르곤, 산소, 질소, 육불화유황, 디플루오로메탄, 삼불화질소, 삼불화염소 등의 가스를 이용하여 행해진다. Etching by methane, perfluoro-tetrafluoro-cyclobutane (C 4 F 8), perfluoro-propane (C 3 F 8), trifluoromethane, carbon monoxide, argon, oxygen, nitrogen, hexafluoride, sulfur, difluoromethyl It is performed using a gas such as methane, nitrogen trifluoride, chlorine trifluoride. 본 발명에서, 기판상에 다공질 하층막을 형성하기 전에, 또는 후에, 반사 방지막, 평탄화 막을 형성할 수 있다. In the present invention, prior to forming the porous lower layer film on a substrate, or after, it is possible to form the anti-reflection film, the planarizing film. 이것에 의해, 기판으로부터의 반사광의 저감, 포토 레지스트 막두께의 균일화 등이 이루어지고, 포토 레지스트 패턴을 정도 좋게 형성하는 것이 가능하게 된다. As a result, a reduction in reflected light from the substrate, a photoresist film of uniform thickness, such as is made, it is possible to form a photoresist pattern is good enough. 본 발명에서, 다공질 하층막은, 반도체 기판상에 발포제 또는 발포성 기를 가지는 폴리머를 포함하는 하층막 형성 조성물을 도포하고, 가열함으로써 형성할 수 있다. In the present invention, the porous lower layer film can be formed by applying an underlayer film forming composition containing a polymer having an expandable foaming agent or on a semiconductor substrate, and heating. 하층막 형성 조성물에 포함되는 상기 발포제로서는, 예를 들면, 가열에 의해 분해하고, 질소, 이산화탄소, 수증기 등의 기체를 발생하는 것을 사용할 수 있다. Examples of the foaming agent contained in the lower layer film composition, for example, can be decomposed by heating, and used to generate a gas of nitrogen, carbon dioxide, water vapor or the like. 120~230℃로 가열함으로써 분해하고, 질소를 발생하는 발포제가 바람직하게 사용된다. Decomposed by heating to 120 ~ 230 ℃, and preferably used are a foaming agent which generates nitrogen. 이러한 발포제로서는, 아조카본산 화합물, 디아조아세트아미드 화합물, 아조니트릴 화합물, 벤젠 술포 히드라진 화합물, 및 니트로소 화합물 등이 있다. Examples of the blowing agent, and the like ah nephew acid compound, Dia Joao set amide compounds, azo nitrile compound, benzenesulfonate hydrazine compounds, and nitroso compounds. 구체적으로는, 아조디카본아미드, 아조디카본산 바륨, 2,2'-아조비스이소부티로니트릴, N,N'-디니트로소펜탄메틸렌테트라민, 4,4-옥시비스벤젠술포닐히드라지드, 4,4'-아조비스(4-시아노발레릭 산), 1,1'-아조비스(시클로헥산카르보니트릴), 1,1'-아조비스(N,N'-디메틸포름아미드), 1,1'-(아조디카르보닐)디피페리딘, 1,3-디페닐트리아젠, 및 4-니트로소레졸신모노메틸에테르 등을 들 수 있다. Specifically, azodicarbonamide, azo-dicarboxylic acid nitrile as barium, 2,2'-azobisisobutyronitrile, N, N'- di-nitroso-pentane tetramine, 4,4-oxybis benzene sulfonyl hydrazide , 4,4'-azobis (4-cyano ballet rigs acid), 1,1'-azobis (cyclohexane carbonitrile), 1,1'-azobis (N, N'- dimethylformamide), 1,1 '-, and the like (azodicarbonyl) dipiperidine, 1,3-diphenyl-tree ahjen, and 4-nitro sore jolsin monomethyl ether. 하층막 형성 조성물에 포함된 상기 발포성 기를 가지는 폴리머로서는, 가열에 의해 분해하고, 질소, 이산화탄소, 수증기 등의 기체를 발생하는 것이 바람직하게 사용된다. Examples of the polymer having an lower layer film of the foamable composition contained in the form, and decomposition by heating is preferably used to generate a gas of nitrogen, carbon dioxide, water vapor or the like. 예를 들면, 아조카본산 구조, 디아조아세트아미드 구조, 아조 니트릴 구조, 벤젠술포히드라진 구조, 및 니트로소 구조 등으로 이루어지는 적어도 하나의 발포성 기를 측쇄(側鎖)에 가지는 폴리에스테르, 폴리에틸렌, 폴리이미드, 아크릴폴리머, 메타크릴폴리머, 폴리비닐에테르, 페놀노보락, 나프톨노보락, 폴리에테르, 폴리아미드, 폴리카보네이트 등의 부가중합계 폴리머, 축중합계 폴리머를 사용할 수 있다. 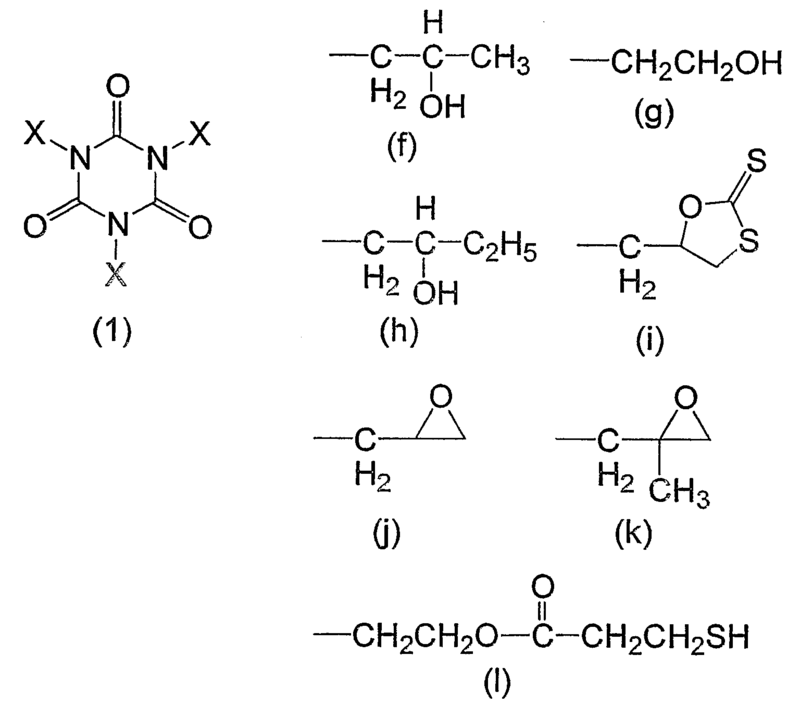 For example, ah nephew acid structure, Dia Joao set amide structure, an azo nitrile structure, benzenesulfonate hydrazine structure, and nitroso structure such as comprising at least one polyester, polyethylene, polyimide having a group in the side chain (側 鎖) foamable , it may be an acrylic polymer, methacrylic polymer, polyvinyl ether, phenol novolak, naphthol novolak, polyether, polyamide, the sum of the addition of a polycarbonate polymer, a condensation polymer in total. 여기서, 발포성기를 가지는 폴리머에서의 발포기의 비율로서는, 예를 들면, 0.1~30 질량%이고, 또한, 예를 들면 0.1~20 질량%이며, 또한 0.2~10 질량%이다. Here, as the ratio of foaming of the polymer having an expandable, for example, 0.1 to 30% by mass and, for example, 0.1 to 20% by mass and 0.2 to 10% by mass. 또한, 발포성기를 가지는 폴리머의 분자량은, 중량평균분자량으로서 500이상이고, 예를 들면, 500~1000000이고, 또는, 1000~500000이고, 또한, 예를 들면 3000~500000이고, 또는 5000~300000이다. In addition, the polymer molecular weight having an effervescent is not less than 500 as a weight average molecular weight, for example, 500 ~ 1000000 and, or, 1000 ~ 500000, and also, for a g 3000 ~ 500000, or 5000 ~ 300000. 본 발명의 하층막 형성 조성물 중 하나는, 기본적 발포제, 유기재료 및 용제로 이루어진 것이다. One of the lower layer of the present invention the film-forming composition has been made by essentially blowing agent, an organic material and a solvent. 또한, 임의성분으로서 가교촉매, 계면활성제 등을 포함하는 것이다. In addition, to include a crosslinking catalyst, a surfactant as an optional component. 본 발명의 하층막 형성 조성물에서의 고형분은, 예를 들면, 0.1~50 질량%이고, 또한, 예를 들면 5~40 질량%이고, 또는 10~35 질량%이다. Solid component in the present invention the lower layer film composition of, for example, is 0.1 and 50% by mass and, for example, a 5 to 40% by mass, or 10 to 35% by weight. 여기서 고형분은, 하층막 형성 조성물의 전성분으로부터 용제성분을 제외한 것이다. The solid content, is other than the solvent component from all components of the underlayer film forming composition. 여기서, 발포제는 필수적인 성분이고, 하층막을 다공질로 하기 위한 것이다. Here, the blowing agent is a required component, and is used to lower layer of a porous film. 즉, 하층막 형성시의 가열에 의해 발포제가 분해하고, 질소, 이산화탄소, 수증기 등의 기체를 발생하고, 이것에 의해 하층막을 다공질로 한다. In other words, the blowing agent by the heating at the time of forming a lower layer film decomposing and generating a gas of nitrogen, carbon dioxide, water vapor, etc., and the lower layer of a porous film by this. 유기재료는, 하층막을 형성하는 성분이다. The organic material is a component forming a lower layer film. 또한, 본 발명의 하층막 형성 조성물은, 스핀 코팅법 등에 의해 반도체 기판상에 도포하는 태양으로 사용되기 때문에, 용액이다. Further, the lower layer film composition of the invention is a solution, because it is used as the sun for coating on a semiconductor substrate by a spin coating method. 본 발명의 하층막 형성 조성물의 고형분에서의 발포제의 비율로서는, 예를 들면, 0.1~30 질량%이고, 또한, 예를 들면 0.1~20 질량%이며, 또한, 0.2~10 질량%이다. As the proportion of blowing agent in the lower layer of the film-forming composition of the invention, the solid, for example, 0.1 to 30% by weight and, also, for example 0.1 to 20% by weight, and, from 0.2 to 10% by mass. 발포제의 비율이 이것보다 작은 경우는, 형성되는 하층막의 다공질성이 충분하지 않고, 또한, 이것보다 큰 경우는, 균일한 하층막을 형성하는 것이 곤란하게 된다. When the proportion of the foaming agent is less than this, without the lower layer film it is porous enough to be formed, and, when greater than this, it is difficult to form uniform lower-layer film. 고형분에서의 유기재료 비율은, 예를 들면, 70~99.9 질량%이고, 또한, 예를 들면 80~99.9 질량%이며, 또한 90~99.8 질량%이다. Organic material ratio of the solid content is, for example, of 70 ~ 99.9% by mass and, for example, is 80 ~ 99.9% by mass and 90 to 99.8% by weight. 본 발명의 하층막 형성 조성물에서, 유기재료는, 특별히 한정되는 것은 아니다. In the lower layer of the present invention the film-forming composition, the organic material is not particularly limited. 이것까지 포토 레지스트의 하층에 마련되는 막을 형성하기 위해 사용되었던 유기재료를 사용할 수 있다. Until it may be an organic material that was used to form a film that is provided on the lower layer of photoresist. 즉, 반사 방지막용의 유기재료나, 평탄화용의 유기재료, 배리어층 용의 유기재료 등을 사용할 수 있다. That is, it is possible to use an organic material for a reflection film or an organic material for the planarization, an organic material, such as for the barrier layer. 유기재료로서는, 예를 들면, 폴리머, 가교성 화합물, 흡광성 화합물 등의 성분이 사용가능하다. As the organic material, for example, the components of the polymer, and the crosslinkable compound, a light-absorbing compound may be used. 그리고, 유기재료로서는, 폴리머, 가교성 화합물 및 흡광성 화합물의 각 성분을 각각 단독으로 사용할 수 있지만, 2개 이상의 성분을 조합시켜 이용할 수도 있다. And, as the organic material, a polymer, a crosslinking compound, and although can be used alone as the components of the light-absorbing compound may be used in combination of two or more components. 유기재료를 조합시킨 것으로는, 폴리머와 가교성 화합물로 이루어진 경우, 가교성 화합물과 흡광성 화합물로 이루어진 경우, 폴리머와 흡광성 화합물로 이루어진 경우, 그리고 폴리머, 가교성 화합물 및 흡광성 화합물에 의해 이루어진 경우가 있다. As a combination of an organic material, if made of a polymer and a crosslinkable compound, if made of a cross-linkable compound and absorbing light component compound, when made of a polymer and absorbing light blocking compound, and made by a polymer, a crosslinkable compound and absorbing light component compound if there is. 유기재료가 그러한 성분을 조합시킨 경우, 각 성분이 유기재료에서 점유하는 비율은, 특별히 한정되는 것은 아니다. The case where an organic material is a combination of such components, the rate at which each component is occupied by the organic material is not particularly limited. 필요에 따라, 각종, 변화가 가능하다. If necessary, various kinds, it is possible to change. 유기재료가 2개의 성분으로 이루어진 경우, 각 성분이 유기재료에서 점유하는 비율은, 예를 들면 각각 1~99 질량%이고, 또는 각각 10~90 질량%이며, 또한, 각각 20~80 질량%이다. If an organic material is made of two components, the ratio occupying in the each component is an organic material, for example, each from 1 to 99 mass% and, or 10 to 90% by weight, respectively, and also, each of 20 to 80% by weight . 유기재료가 폴리머, 가교성 화합물 및 흡광성 화합물의 3개의 성분으로 이루어진 경우, 폴리머가 유기재료에서 점유하는 비율은, 예를 들면, 30~99 질량%이고, 또는 50~95 질량% 이며, 또한, 60~90 질량% 이다. If an organic material is made of three components of the polymer, a crosslinkable compound and absorbing light blocking compound, the rate at which the polymer is occupied by the organic material may be, for example, of 30 ~ 99 mass% and, or 50 to 95% by mass and , from 60 to 90% by weight. 가교성 화합물 및 흡광성 화합물이 유기재료에서 점하는 비율은, 예를 들면, 각각 0.1~69 질량%이고, 또는 각각 0.1~49 질량%이며, 또한 각각 0.5~39 질량% 이다. The rate at which points in the crosslinking compound and a light-absorbing compound is an organic material, for example, respectively 0.1 to 69% by weight, and or from 0.1 ~ 49% by weight each, and from 0.5 to 39% by mass, respectively. 본 발명의 하층막 형성 조성물의 유기재료로서 사용되는 폴리머로서는, 특히 그 종류가 한정되는 것은 아니다. As the polymer used as the organic material for the underlayer film forming composition of the present invention, especially but not limited to those types. 폴리에스테르, 폴리스티렌, 폴리이미드, 아크릴폴리머, 메타크릴폴리머,폴리비닐에테르, 페놀노보락, 나프톨노보락, 폴리에테르, 폴리아미드, 폴리카보네이트 등의 부가 중합계 폴리머, 축중합계 폴리머를 사용할 수 있다. A polyester, polystyrene, polyimide, acrylic polymer, methacrylic polymer, polyvinyl ether, phenol novolak, an addition polymerization type polymer such as a naphthol novolak, polyether, polyamide, polycarbonate, condensation total polymer may be used. 본 발명의 하층막 형성 조성물로 형성되는 하층막에 반사 방지 기능을 부여하는 경우에는, 하층막 중에, 노광에 사용되는 빛을 흡수하는 성분이 포함되는 것이 필요하다. When given an anti-reflection function to the lower layer film is formed of a lower layer film forming composition of the present invention, the lower layer film, it is necessary that includes a component that absorbs light used for exposure. 이러한 경우, 흡광부위로서 기능하는, 벤젠 고리, 나프탈렌 고리, 안트라센 고리, 트리아진 고리, 키노린 고리, 키녹사린 고리 등의 방향 고리 구조를 가지는 폴리머가 바람직하게 사용된다. In this case, a polymer having an aromatic ring structure such as benzene ring, naphthalene ring, anthracene ring, triazine ring, aimed key ring, the key ring noksa Lin, functioning as a light absorbing region is preferably used. 이러한 폴리머로서는, 예를 들면, 벤질 아크릴레이트, 벤질 메타크릴레이트, 페닐 아크릴레이트, 나프틸 아크릴레이트, 안트릴 메타크릴레이트, 안트릴 메틸메타크릴레이트, 스티렌, 히드록시스티렌, 벤질 비닐에테르, N-페닐 말레이미드 등의 부가 중합성 모노머를 그 구조단위로 함유하는 부가 중합계 폴리머나, 페놀노보락, 나프톨노보락 등의 축중합계 폴리머를 들 수 있다. As such a polymer, for example, benzyl acrylate, benzyl methacrylate, phenyl acrylate, naphthyl acrylate, anthryl methacrylate, anthryl methyl methacrylate, styrene, hydroxy styrene, benzyl vinyl ether, N - it can be given an addition polymerization type polymer or a phenol novolak, the total condensation polymers such as naphthol novolak containing addition polymerizable monomers such as phenyl maleimide as a structural unit. 또한, 미국특허 제6323310호 명세서에 기재되어 있는, 트리아진 화합물(상품명 Cyme 1303, Cyme 11123)로부터 제조되는 폴리머를 들 수 있다. In addition, there may be mentioned a polymer prepared from the U.S. Patent No. 6.32331 million are described in, triazine compound (trade name Cyme 1303, Cyme 11123) in the specification. 또한, 하기 (a)~(e)의 구조단위를 가지는 폴러미도 들 수 있다. In addition, there may be mentioned polar shown having a structural unit of the following (a) ~ (e). 본 발명의 하층막 형성 조성물로 형성되는 다공질 하층막에 반사 방지 기능이 요구되지 않는 경우에는, 흡광부위로서 기능하는 방향 고리 구조를 가지지 않는 폴리머를 사용할 수 있다. If it does not, the antireflection function required for the porous lower layer film is formed of a lower layer film forming composition of the present invention, it is possible to use a polymer that does not have an aromatic ring structure functioning as a light absorbing region. 이러한 폴리머로서는 예를 들면 아크릴 산, 메타크릴 산, 알킬 아크릴레이트, 알킬 메타크릴레이트, 비닐 알콜, 알킬 비닐 에테르, 아크릴로니트릴, 말레이미드, N-알킬 말레이미드, 말레인산 무수물 등의 방향 고리 구조를 가지지 않는 부가 중합성 모노머만 그 구조단위로서 포함하는 부가 중합계 폴리머를 들 수 있다. The polymer includes, for example acrylonitrile acid, methacrylic acid, alkyl acrylate, alkyl methacrylate, vinyl alcohol, alkyl vinyl ether, acrylonitrile, an aromatic ring structure, such as maleimide, N- alkyl-maleimide, maleic anhydride have only addition polymerizable monomers that may be mentioned addition polymerization type polymers, including as a structural unit. 본 발명에서, 상기 유기재료로서 부가중합계 폴리머가 사용되는 경우, 그 폴리머는 단독 중합체로도 좋고 공중합체로도 좋다. In the present invention, when the sum of the addition polymer used as the organic material, the polymer may be a homopolymer may be copolymers. 부가중합계 폴리머의 제조에는 부가 중합성 모노머가 사용된다. Preparation of total polymer of the addition there is used the addition polymerizable monomer. 이러한 부가 중합성 모노머로서는 아크릴산, 메타크릴산, 아크릴산 에스테르 화합물, 메타크릴산 에스테르 화합물, 아크릴아미드 화합물, 메타크릴아미드 화합물, 비닐 화합물, 스티렌 화합물, 말레이미드 화합물, 말레인산 무수물, 아크릴로니트릴 등을 들 수 있다. Examples of the addition polymerizable monomer include acrylic acid, methacrylic acid, acrylate ester compounds, methacrylate ester compounds, acrylamide compounds, methacrylamide compounds, vinyl compounds, styrene compounds, maleimide compounds, maleic anhydride, etc. Acrylonitrile can. 아크릴산 에스테르 화합물로는, 메틸 아크릴레이트, 에틸 아크릴레이트, 노말 헥실 아크릴레이트, 이소 프로필 아크릴레이트, 시클로 헥실 아크릴레이트, 벤질 아크릴레이트, 페닐 아크릴레이트, 안트릴 메틸아크릴레이트, 2-히드록시 에틸 아크릴레이트, 3-클로로-2-히드록시 프로필 아크릴레이트, 2-히드록시 프로필 아크릴레이트, 2,2,2-트리 플루오로 에틸 아크릴레이트, 2,2,2-트리클로로에틸 아크릴레이트, 2-브로모 에틸 아크릴레이트, 4-히드록시 부틸 아크릴레이트, 2-메톡시 에틸 아크릴레이트, 테트라 히드로 푸르푸릴 아크릴레이트, 2-메틸-2-아다만틸 아크릴레이트, 5-아크릴로일옥시-6-히드록시노보넨-2-카르복실릭-6-락톤, 3-아크릴록시 프로필 트리에톡시 실란, 글리시딜 아크릴레이트 등을 들 수 있다. Acrylic ester compounds include methyl acrylate, ethyl acrylate, normal hexyl acrylate, isopropyl acrylate, cyclohexyl acrylate, benzyl acrylate, phenyl acrylate, anthryl methyl acrylate, 2-hydroxyethyl acrylate , 3-chloro-2-hydroxypropyl acrylate, 2-hydroxypropyl acrylate, 2,2,2-trifluoromethyl acrylate, 2,2,2-trichloroethyl acrylate, 2-bromo acrylate, 4-hydroxybutyl acrylate, 2-methoxyethyl acrylate, tetrahydrofurfuryl acrylate, 2-methyl-2-adamantyl when yloxy as butyl acrylate, 5-hydroxy-6-acrylic norbornene-2-carboxylic-6-lactone, silane, 3-acryloxy propyl tree glycidyl acrylate, and the like dill. 메타크릴산 에스테르 화합물로는, 메틸 메타크릴레이트, 에틸 메타크릴레이트, 노말 헥실 메타크릴레이트, 이소 프로필 메타크릴레이트, 시클로헥실 메타크릴레이트, 벤질 메타크릴레이트, 페닐 메타크릴레이트, 안트릴 메틸메타크릴레이트, 2-히드록시 에틸 메타크릴레이트, 2-히드록시 프로필 메타크릴레이트, 2,2,2-트리플루오로 에틸 메타크릴레이트, 2,2,2-트리클로로 에틸 메타크릴레이트, 2-브로모 에틸 메타크릴레이트, 4-히드록시 부틸 메타크릴레이트, 2-메톡시 에틸 메타크릴레이트, 테트라 히드로 푸르푸릴 메타크릴레이트, 2-메틸-2-아다만틸 메타크릴레이트, 5-메타크릴로일옥시-6-히드록시노보넨-2-카르복실릭-6-락톤, 3-메타크릴옥시프로필트리에톡시실란 글리시딜 메타크릴레이트, 2-페닐에틸 메타크릴레이트, 히드록시 페닐 메타크릴레이트, A methacrylate ester compound include methyl methacrylate, ethyl methacrylate, normal hexyl methacrylate, isopropyl methacrylate, cyclohexyl methacrylate, benzyl methacrylate, phenyl methacrylate, anthryl methylmethacrylate methacrylate, 2-hydroxyethyl methacrylate, 2-hydroxypropyl methacrylate as, 2,2,2-trifluoro ethyl methacrylate, 2,2,2-trichloroethyl methacrylate, 2 bromoethyl methacrylate, 4-hydroxybutyl methacrylate, 2-methoxyethyl methacrylate, tetrahydrofurfuryl methacrylate, 2-methyl-2-adamantyl methacrylate, 5-methacrylate in-yloxy-6-hydroxy-norbornene-2-carboxylic-6-lactone, 3-methacryloxypropyl when glycidyl silane on propyltriethoxysilane methacrylate, 2-phenylethyl methacrylate, hydroxyphenyl meta methacrylate, 브로모 페닐 메타크릴레이트 등을 들 수 있다. And the like bromophenyl methacrylate. 아크릴아미드 화합물로는, 아크릴아미드, N-메틸아크릴아미드, N-에틸아크릴아미드, N-벤질 아크릴아미드, N-페닐 아크릴아미드, N,N-디메틸 아크릴아미드, N-안트릴 아크릴아미드 등을 들 수 있다. Of the acrylamide compound include acrylamide, N- methylacrylamide, N- ethyl acrylamide, N- benzyl acrylamide, N- phenyl-acrylamide, N, N- dimethylacrylamide, N- anthryl acrylamide, etc. can. 메타크릴아미드 화합물로는, 메타크릴아미드, N-메틸 메타크릴아미드, N-에틸 메타크릴아미드, N-벤질 메타크릴아미드, N-페닐 메타크릴아미드, N,N-디메틸 메타크릴아미드, N-안트릴 메타크릴아미드 등을 들 수 있다. A methacrylamide compound include methacrylamide, N- methyl-methacrylamide, N- methacrylamide, N- benzyl methacrylamide, N- phenyl methacrylamide, N, N- dimethyl-methacrylamide, N- not, and the like trill methacrylamide. 비닐 화합물로는, 비닐 알콜, 2-히드록시 에틸 비닐 에테르, 메틸 비닐 에테르, 에틸 비닐 에테르, 벤질 비닐 에테르, 비닐 초산(酢酸), 비닐 트리메톡시 실란, 2-클로로 에틸 비닐 에테르, 2-메톡시 에틸 비닐 에테르, 비닐 나프탈렌, 비닐 안트라센 등을 들 수 있다. A vinyl compound include vinyl alcohol, 2-hydroxyethyl vinyl ether, methyl vinyl ether, ethyl vinyl ether, benzyl vinyl ether, vinyl acetate (酢 酸), vinyltrimethoxysilane, 2-chloroethyl vinyl ether, 2-methoxy ethoxyethyl there may be mentioned a vinyl ether, vinyl naphthalene, vinyl anthracene and the like. 스티렌 화합물로는, 스티렌, 히드록시 스티렌, 클로로 스티렌, 브로모 스티렌, 메톡시 스티렌, 시아노 스티렌, 아세틸 스티렌 등을 들 수 있다. Of styrene compounds, and the like can be mentioned styrene, hydroxystyrene, chlorostyrene, bromostyrene, methoxy styrene, cyano styrene, styrene-acetyl. 말레이미드 화합물로는, 말레이미드, N-메틸 말레이미드, N-페닐 말레이미드, N-시클로헥실 말레이미드, N-벤질 말레이미드, N-히드록시 에틸 말레이미드 등을 들 수 있다. A maleimide compound, there may be mentioned maleimide, N- methyl maleimide, N- phenylmaleimide, N- cyclohexyl maleimide, N- benzyl maleimide, N- hydroxyethyl maleimide and the like. 본 발명에서, 상기 유기재료로 사용되는 축중합계 폴리머로는, 예를 들면, 글리콜 화합물과 디카본산 화합물의 축중합 폴리머를 들 수 있다. In the present invention, a total condensation polymer is used as the organic material includes, for example, a polycondensation polymer of the glycol compound and dicarboxylic acid compound. 글리콜 화합물로는 디에틸렌 글리콜, 헥사 메틸렌 글리콜, 부틸렌 글리콜 등을 들 수 있다. A glycol compound, and the like, diethylene glycol, hexamethylene glycol, butylene glycol. 디카본산 화합물로는, 호박산, 아디프산, 테레프탈산, 무수 말레인산 등을 들 수 있다. A dicarboxylic acid compound, there may be mentioned succinic acid, adipic acid, terephthalic acid, maleic anhydride and the like. 또한, 예를 들면, 폴리피로메리트 이미드, 폴리(p-페닐렌테레프탈 아미드), 폴리부틸렌 테레프탈레이트, 폴리에틸렌 테레프탈레이트 등의 폴리에스테르, 폴리아미드, 폴리이미드를 들 수 있다. Also, for example, there may be mentioned poly-pyromellitic imides, poly (p- phenylene terephthalamide), poly (butylene terephthalate), polyester, polyamide, polyethylene terephthalate, polyimide. 본 발명의 하층막 형성 조성물의 유기재료로 사용되는 폴리머의 분자량으로는, 중량평균 분자량으로, 예를 들면, 1000~1000000이고, 또는 3000~300000이며, 또한, 예를 들면 5000~200000이고, 또는 8000~100000이다. Molecular weight of the polymer that is used as an organic material for the underlayer film forming composition of the present invention, the weight average molecular weight, for example, 1000 ~ 1000000, and is or 3000 ~ 300000, also, for example, is 5000 ~ 200000, or It is 8000-100000. 본 발명의 하층막 형성 조성물의 유기재료로 사용되는 가교성 화합물로는, 특별히 그 종류가 한정되지는 않는다. A cross-linkable compound is used as an organic material for the underlayer film forming composition of the present invention include, but are particularly the kind is not limited. 가교성 화합물로는, 멜라민 화합물, 치환 요소 화합물, 에폭시기를 함유하는 폴리머계 가교성 화합물 등을 들 수 있다. A crosslinkable compound, there may be mentioned a melamine compounds, substituted urea compounds, a polymer-based crosslinking compound containing an epoxy group or the like. 바람직하게는, 적어도 2개의 가교형성 치환기를 가지는 가교성 화합물이며, 메톡시 메틸화 글리콜 우릴, 또는 메톡시 메틸화 멜라민 등의 화합물이다. Preferably, the crosslinking compound having at least two crosslinking substituent, the compounds such as methoxy-methylated glycoluril or methoxy methylated melamine. 예를 들면, 테트라 메톡시 메틸 글리콜 우릴, 헥사 메톡시 메틸 멜라민, 테트라 메톡시 벤조 구아나민 등이다. For example, it is tetramethoxymethyl glycoluril, hexamethoxymethylmelamine, tetramethoxysilane benzoguanamine. 또한, 테트라 메톡시 메틸 요소, 테트라 부톡시 메틸 요소 등의 화합물도 들 수 있다. In addition, there may be mentioned also compounds such as tetramethoxymethyl urea, tetra-butoxymethyl element. 이들 가교성 화합물은 자기 축합에 의한 가교반응을 일으킬 수 있다. 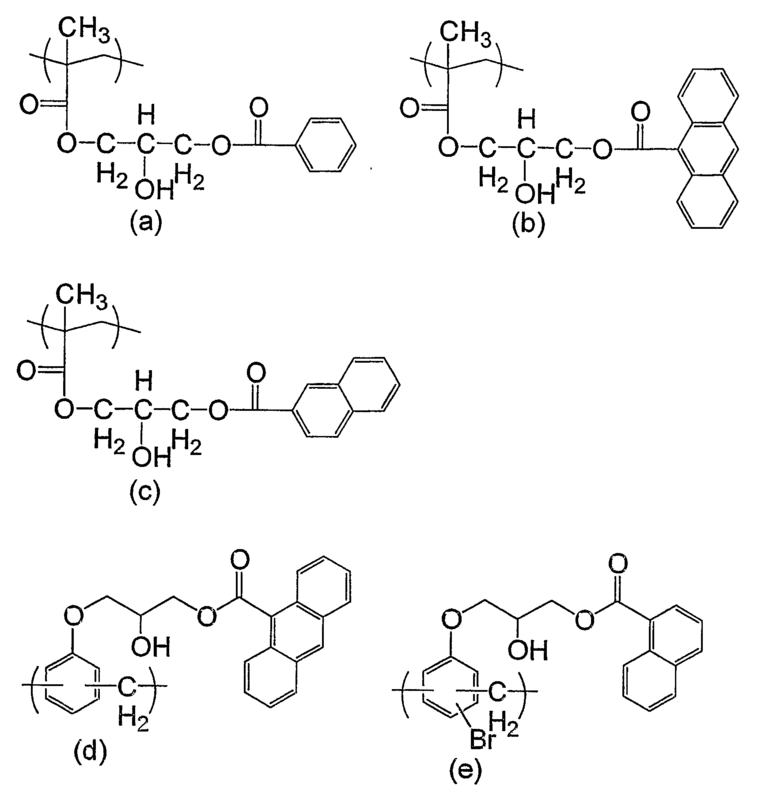 These crosslinkable compounds can cause a cross-linking reaction by self condensation. 또한, 폴리머나 흡광성 화합물과 조합시켜 사용되는 경우, 폴리머나 흡광성 화합물 중에 수산기나 카르복실기 등의 가교성 치환기가 존재하는 경우는, 이들 가교성 치환기 와 가교반응을 일으킬 수 있다. Further, when used in combination with the polymer or light-absorbing compound, when the crosslinking substituents such as hydroxyl and carboxyl groups in the polymer or light-absorbing compound is present, it can lead to these crosslinkable substituents with a cross-linking reaction. 본 발명의 하층막 형성 조성물이 가교성 화합물을 포함하고 있는 경우, 가교반응으로 인하여, 그 조성물로 형성되는 다공질 하층막은 강고한 막으로 된다. If that contains the crosslinkable compound underlayer film forming composition of the present invention, due to the cross-linking reaction, it is a rigid porous membrane film is the lower layer formed with the composition. 즉, 반도체 기판상에 도포되는 하층막 형성 조성물의 가열에 의한 하층막 형성중에 가교반응이 일어난다. That is, the cross-linking reaction takes place in the lower layer film formation by heating of the lower layer film composition applied to a semiconductor substrate. 그 결과, 형성되는 다공질 하층막은 포토레지스트에 사용되는 유기용제, 예를 들면, 에틸렌 글리콜 모노메틸 에테르, 에틸 세로솔브 아세테이트, 디에틸렌 글리콜 모노에틸 에테르, 프로필렌 글리콜, 프로필렌 글리콜 모노메틸 에테르, 프로필렌 글리콜 모노메틸 에테르 아세테이트, 프로필렌 글리콜 프로필 에테르 아세테이트, 톨루엔, 시클로헥사논, 2-히드록시 프로피온산 에틸, 에톡시 초산(酢酸) 에틸, 젖산 에틸, 젖산 부틸 등에 대한 용해성이 낮은 것으로 된다. As a result, the organic solvent used for the porous lower layer film is a photoresist which is formed, for example, ethylene glycol monomethyl ether, ethyl cellosolve acetate, diethylene glycol monoethyl ether, propylene glycol, propylene glycol monomethyl ether, propylene glycol monomethyl solubility or the like ether acetate, propylene glycol propyl ether acetate, toluene, cyclohexanone, 2-hydroxy ethyl, ethoxy ethyl (酢 酸) acetate, ethyl lactate, butyl lactate is to be low. 본 발명의 하층막 형성 조성물의 유기재료로 사용되는 흡광성 화합물은, 특별히 그 종류가 한정되는 것은 아니다. Light-absorbing compound is used as an organic material for the underlayer film forming composition of the present invention is not particularly limited to those types. 흡광성 화합물의 종류, 첨가량을 선택함으로써, 본 발명의 하층막 형성 조성물로 형성되는 다공질 하층막의 굴절율, 감쇠(減衰)계수 등의 특성을 조절하는 것이 가능하다. By selecting the type and addition amount of the light-absorbing compound, it is possible to adjust the properties such as refractive index of the lower layer film porous lower layer film formed from a composition for forming, attenuation (減 衰) factor of the present invention. 이러한 흡광성 화합물로는, 다공질 하층막의 위에 놓여진 포토 레지스트 층 중의 감광성분의 감광 특성 파장 영역에서의 빛에 대하여 높은 흡수능을 가지는 화합물이 바람직하게 이용된다. These light-absorbing compounds, is having a high absorption capacity to light in a photosensitive characteristic of the photosensitive components in a photoresist layer overlying the porous lower layer film wavelength range compounds are preferably used. 흡광성 화합물은 1종만을 이용할 수도 있지만, 2종이상을 조합시켜 이용할 수도 있다. Light-absorbing compound, but also it is used alone or may be used in combination of two or more. 흡광성 화합물로는, 예를 들면, 페닐 화합물, 벤조페논 화합물, 벤조트리아졸 화합물, 아조 화합물, 나프탈렌 화합물, 안트라센 화합물, 안트라키논 화합물, 트리아진 화합물, 트리아진 트리온 화합물, 키노린 화합물 등을 사용할 수 있다. By absorbing light blocking compounds is, for the example, phenyl compounds, benzophenone compounds, benzotriazole compounds, azo compounds, naphthalene compounds, anthracene compounds, anthraquinone kinon compounds, triazine compounds, triazine tree on the compound, the key aimed compound, such as It can be used. 페닐 화합물, 나프탈렌 화합물, 안트라센 화합물, 트리아진 화합물, 트리아진 트리온 화합물 등을 이용할 수 있다. Phenyl compounds, naphthalene compounds, anthracene compounds, triazine compounds, triazine compounds, etc. on the tree can be used. 흡광성 화합물로는, 적어도 하나의 수산기, 아미노기 또는 카르복실기를 가지는 페닐 화합물, 적어도 하나의 수산기, 아미노기 또는 카르복실기를 가지는 나프탈렌 화합물, 적어도 하나의 수산기, 아미노기 또는 카르복실기를 가지는 안트라센 화합물이 바람직하게 사용된다. By absorbing light blocking compounds is, at least using one of an anthracene compound having a hydroxyl group, a phenyl compound, at least one hydroxyl group, a naphthalene compound, at least one hydroxyl group with an amino group or a carboxyl group, an amino group or a carboxyl group with an amino group or a carboxyl group is preferable. 적어도 하나의 수산기, 아미노기 또는 카르복실기를 가지는 페닐 화합물로는, 페놀, 브로모 페놀, 4,4'-술포닐 디페놀, tert-부틸 페놀, 비페놀, 안식향산, 살리틸산, 히드록시 이소프탈산, 페닐 초산(酢酸), 아닐린, 벤질 아민, 벤질 알콜, 신나밀 알콜, 페닐 아라닌, 페녹시 브로판올, 4-브로모 안식향산, 3-요드 안식향산, 2,4,6-트리브로모 페놀, 2,4,6-트리브로모 레졸시놀, 3,4,5-트리요드 안식향산, 2,4,6-트리요드-3-아미노 안식향산, 2,4,6-트리요드-3-히드록시 안식향산, 2,4,6-트리브로모-3-히드록시 안식향산 등을 들 수 있다. A phenyl compound having at least one hydroxyl group, amino group or carboxyl group, phenol, bromophenol, 4,4'-sulfonyl diphenol, tert- butylphenol, biphenol, benzoate, salicylate tilsan, hydroxy isophthalic acid, phenyl acetate (酢 酸), aniline, benzylamine, benzyl alcohol, cinnamyl alcohol, phenyl Ara Nin, phenoxy panol bromo, 4-bromo benzoic acid, 3-iodine-benzoic acid, 2,4,6-tribromophenol, 2, 4, 6-tribromo resorcinol, 3,4,5-tree iodine acid, 2,4,6-iodine-3-aminobenzoic acid, 2,4,6-iodine-3-hydroxy benzoic acid, 2,4,6-tree ribs and the like can be given parent-3-hydroxy-benzoic acid. 적어도 하나의 수산기, 아미노기, 또는 카르복실기를 가지는 나프탈렌 화합물로는, 1-나프탈렌 카본산, 2-나프탈렌 카본산, 1-나프톨, 2-나프톨, 1-아미노 나프탈렌, 나프틸 초산(酢酸), 1-히드록시-2-나프탈렌 카본산, 3-히드록시-2-나프탈렌 카본산, 3,7-디히드록시-2-나프탈렌 카본산, 6-브로모-2-히드록시 나프탈렌, 2,6-나프탈렌 디카본산, 등을 들 수 있다. A naphthalene compound having at least one hydroxyl group, an amino group, or carboxyl group, 1-naphthalene carboxylic acid, 2-naphthalene carboxylic acid, 1-naphthol, 2-naphthol, 1-amino-naphthalene, naphthyl acetate (酢 酸), 1 hydroxy-2-naphthalene carboxylic acid, 3-hydroxy-2-naphthalene carboxylic acid, 3,7-dihydroxy-2-naphthalene carboxylic acid, 6-bromo-2-hydroxy-naphthalene, 2,6-naphthalene dicarboxylic acid may be mentioned, and the like. 적어도 하나의 수산기, 아미노기, 또는 카르복실기를 가지는 안트라센 화합 물로는, 9-안트라센 카본산, 9-히드록시 메틸 안트라센, 1-아미노 안트라센, 등을 들 수 있다. There may be mentioned at least one hydroxyl group, an amino group, an anthracene compound or water having a carboxyl group, 9-anthracene carboxylic acid, 9-hydroxymethyl anthracene, 1-amino-anthracene, and the like. 의 화합물을 들 수 있다. Of and compounds. 여기서, 식 중, X는 (f)~(l)의 기를 나타낸다. Here, in the formula, X represents a group of (f) ~ (l). 본 발명의 하층막 형성 조성물에서는, 각종의 용제를 사용할 수 있다. In the lower layer film composition of the present invention, it is possible to use a variety of solvents. 그러한 용제로서는, 에틸렌 글리콜 모노 메틸 에테르, 에틸렌 글리콜 모노 에틸 에테르, 메틸 세로솔브 아세테이트, 에틸 세로솔브 아세테이트, 디에틸렌 글리콜 모노 메틸 에테르, 디에틸렌 글리콜 모노 에틸 에테르, 프로필렌 글리콜, 프로필렌 글리 콜 모노 메틸 에테르, 프로필렌 글리콜 모노 메틸 에테르 아세테이트, 프로필렌 글리콜 프로필 에테르 아세테이트, 톨루엔, 크실렌, 메틸 에틸 케톤, 시클로 펜타논, 시클로 헥사논, 2-히드록시 프로피온산 에틸, 2-히드록시-2-메틸 프로피온산 에틸, 에톡시 초산(酢酸) 에틸, 히드록시 초산(酢酸) 에틸, 2-히드록시-3-메틸 부탄산 메틸, 3-메톡시 프로피온산 메틸, 3-메톡시 프로피온산 에틸, 3-에톡시 프로피온산 에틸, 3-에톡시 프로피온산 메틸, 피르빈산 메틸, 피르빈산 에틸, 초산(酢酸) 에틸, 초산(酢酸) 부틸, As such a solvent, ethylene glycol monomethyl ether, ethylene glycol monoethyl ether, methyl cellosolve acetate, ethyl cellosolve acetate, diethylene glycol monomethyl ether, diethylene glycol monoethyl ether, propylene glycol, propylene glycol monomethyl ether, propylene glycol monomethyl ether acetate, propylene glycol propyl ether acetate, toluene, xylene, methyl ethyl ketone, cyclopentanone, cyclohexanone, 2-hydroxy ethyl, 2-hydroxy-2-methyl propionate, ethyl ethoxy acetate (酢 酸) ethyl, hydroxy ethyl (酢 酸) ethyl, 2-hydroxy-3-methyl butanoic acid methyl, 3-methoxy methyl propionate, 3-methoxy propionate, ethyl 3-ethoxy propionate, ethyl 3-ethoxy methyl propionate, methyl pireu acid, pireu acid, ethyl acetate (酢 酸), ethyl acetate (酢 酸) butyl, 젖산 에틸, 젖산 부틸, 디메틸 포름 아미드, 디메틸 아세트 아미드, 디메틸 술폭시드, N-메틸피로리돈 등을 이용할 수 있다. Such as ethyl lactate, butyl lactate, dimethylformamide, dimethylacetamide, dimethyl sulfoxide, N- methyl-pyrrolidone can be used. 이들 용제는 단독으로, 또는 2종이상을 조합하여 사용된다. These solvents may be used alone or in combination of two or more kinds. 본 발명에서 하층막 형성조성물의 다른 하나는, 발포성기를 가지는 폴리머 및 용제로 이루어진 것, 또는, 발포성 기를 가지는 폴리머, 유기재료 및 용재로 이루어진 것이다. The other one of the lower layer film composition in the present invention, will be made of a polymer and a solvent having an expandable, or is made of a polymer organic material and the timber having an expandable. 또한, 임의성분으로서 가교촉매, 계면활성제 등을 포함하는 것이다. In addition, to include a crosslinking catalyst, a surfactant as an optional component. 하층막 형성조성물에서 고형분은, 예를 들면 0.1~50 질량%이고, 또한, 예를 들면 5~40 질량%이며, 또는, 10~35 질량%이다. In the lower layer film composition is a solid, for example 0.1 to 50 mass%, and also, for example, 5 to 40% by mass, or 10 to 35% by mass. 여기서 고형분은, 하층막 형성 조성물의 전성분으로부터 용제성분을 제외한 것이다. The solid content, is other than the solvent component from all components of the underlayer film forming composition. 여기서, 발포성기를 가지는 폴리머는 필수성분이고, 하층막을 형성하는 성분인 동시에, 하층막을 다공질로 하는 것이다. Here, the polymer having an effervescent is an essential component, at the same time, the components forming the lower layer film, to the lower layer of a porous film. 유기재료는, 하층막을 형성하는 성분이다. The organic material is a component forming a lower layer film. 또한, 본 발명의 하층막 형성 조성물은, 스핀코팅법 등에 의해 반도체 기판상에 도포하는 태양으로 사용되기 때문에, 용액이다. Further, the lower layer film composition of the invention is a solution, because it is used as the sun for coating on a semiconductor substrate by a spin coating method. 본 발명의 하층막 형성 조성물이 발포성기를 가지는 폴리머, 유기재료 및 용제로 이루어진 경우, 그 고형분에서의 발포성기를 가지는 폴리머의 비율은, 예를 들면 50~95 질량%이고, 또한, 예를 들면 60~90 질량% 이며, 또한, 65~85 질량%이다. When made of a polymer organic material and a solvent having a lower layer film the composition for forming an effervescent of the present invention, the ratio of the polymer having an expandable in the solid content is, for example, a 50 to 95% by mass and, for example, 60 to and 90% by mass and is 65 to 85% by weight. 그리고, 고형분에서의 유기재료의 비율은, 예를 들면, 5~50 질량%이고, 또한, 예를 들면 10~40 질량%이고, 또한, 15~35 질량% 이다. And, the proportion of the organic material in the solid content is, for example, a 5 to a 50% by mass and, for example, 10 to 40% by mass and 15 to 35% by mass. 발포성기를 가지는 폴리머의 비율이 이것보다도 작은 경우는, 형성되는 하층막의 다공질성이 충분하지 않게 된다. When the proportion of the polymer having an expandable smaller than this, the lower-layer porous film that is formed is not sufficient. 그리고, 유기재료 및 용제로서는 상기와 동일한 것을 사용할 수 있다. And, it is possible to use the same meanings as defined above as the organic material and a solvent. 본 발명의 하층막 형성 조성물에는, 산 화합물 또는 산 발생제를 첨가할 수 있다. Lower layer film formation composition of the present invention, it is possible to add the acid compound or acid generator. 산 화합물 또는 산발생제는, 상기 가교반응의 촉매로서의 역할을 가지는 것이다. Acid or acid generator compound, will have a role as a catalyst for the crosslinking reaction. 그러한 산 화합물 또는 산 발생제로서는, p-톨루엔 술폰산, 트리 플루오로 메탄 술폰산, 피리디늄-p-톨루엔 술폰산, 살리틸산, 술포 살리틸산, 구연산, 안식향산, 히드록시 안식향산 등의 산 화합물, 또는, 2,4,4,6-테트라 브로모 시클로 헥사 디에논, 2-니트로 벤질 토실레이트, 비스(4-t-부틸페닐)요드늄 트리플루오로 메탄 술포네이트, 트리 페닐 술포늄 트리 플루오로 메탄 술포네이트, 페닐 비스(트리클로로메틸)-s-트리아진, 벤조인 토실레이트, N-히드록시 숙신 이미드 트리플루오로 메탄 술포네이트 등의 산 발생제를 들 수 있다. Acid compounds such as such as the acid compound or acid generator, p- toluenesulfonic acid, trifluoromethane sulfonic acid, pyridinium -p- toluenesulfonate, salicylate tilsan, sulfonyl tilsan salicylate, citric acid, benzoic acid, hydroxybenzoic acid, or 2 , 4,4,6- tetrahydro-bromo-cyclohexanone non-diethoxy, 2-nitrobenzyl tosylate, bis (4-t- butylphenyl) iodonium iodide trifluoromethanesulfonate, triphenylsulfonium trifluoromethanesulfonate , phenyl-bis (trichloromethyl) -s- triazine, may be mentioned benzoin tosylate, acid generators such as N- hydroxysuccinimidyl imide trifluoromethanesulfonate claim. 이들 산 화합물 또는 산 발생제 화합물의 첨가량은, 고형분 중에서 10 질량% 이하이고, 예를 들면, 0.02~10 질량%이며, 또한, 예를 들면 0.04~5 질량%이다. The added amount of these acid compounds or acid-generating compound is from 10% by mass or less in the solid content, and for example, 0.02 ~ 10% by weight and also, for example, 0.04 to 5 mass%. 또한, 본 발명의 하층막 형성 조성물에는, 상기 이외에 필요에 따라 레올로지 조정제, 접착보조제, 계면활성제 등을 첨가할 수 있다. Further, the lower layer film composition of the present invention, it is possible to add a rheology control agent, adhesion aid, surface active agent or the like as needed in addition to the above. 레올로지 조정제는, 주로 하층막 형성 조성물의 유동성을 향상시키고, 특히 가열공정에서, 홀 내부로의 하층막 형성 조성물의 충진성을 높일 목적으로 첨가된다. Rheology modifiers, and largely improve the fluidity of the underlayer film forming composition, and is particularly added for the purpose to increase the filling property of the composition for forming a lower layer film in the heating step, the inside of the hole. 구체예로서는, 예를 들면, 디메틸 프탈레이트, 디에틸 프탈레이트, 디이소부틸 프탈레이트, 부틸 이소데실 프탈레이트 등의 프탈산 유도체, 디노말부틸 아디페이트, 디이소옥틸 아디페이트, 옥틸데실 아디페이트 등의 아디핀산 유도체, 디노말 부틸 말레이트, 디에틸 말레이트, 디노닐 말레이트 등의 말레인산 유도체, 메틸 올레이트, 부틸 올레이트, 테트라 히드로 푸르푸릴 올레이트 등의 올레인산 유도체, 및 노말부틸 스테아레이트, 글리세릴 스테아레이트 등의 스테아린산 유도체를 들 수 있다. Specific examples include, for example, dimethyl phthalate, diethyl phthalate, diisobutyl phthalate, butyl isodecyl phthalate, such as phthalic acid derivatives, Dino end-butyl adipate, diisooctyl adipate, octyl decyl adipate adipic acid derivatives such as sulfate, gavel end-butyl maleate, diethyl maleate, dinonyl maleate, such as the maleic acid derivatives, methyl oleate, butyl oleate, tetrahydrofurfuryl oleate, etc. of oleic acid derivatives, and n-butyl stearate, glyceryl stearate, etc. of the stearic acid derivative it may be mentioned. 이들 레올로지 조정제는, 하층막 형성 조성물의 고형분 중에서, 20 질량% 미만의 비율로 첨가된다. The rheology adjusting agent is, in a solid content of the lower layer film-forming composition, is added in a proportion of less than 20% by weight. 접착 보조제는, 주로 반도체 기판 혹은 반사 방지막 또는 포토 레지스트층과 하층막의 밀착성을 향상시키고, 특히 현상(現像)에서 박리하지 않도록 하는 목적으로 첨가된다. Adhesion aid is added mainly for the purpose of improvement so as not to peel from the semiconductor substrate or anti-reflective coating or a photoresist layer and the lower layer film adhesion and, in particular phenomenon (現 像). 구체예로서는, 예를 들면, 트리메틸 클로로 실란, 디메틸 비닐 클로로 실란, 클로로 메틸 디메틸 클로로 실란 등의 클로로 실란류, 트리메틸 메톡시 실란, 디메틸 디에톡시 실란, 디메틸 비닐 에톡시 실란, γ-메타크릴옥시 프로필 트리메톡시 실란, 디페닐 디메톡시 실란 등의 알콕시 실란류, 헥사메틸 디실라잔, N,N'-비스(트리메틸시릴)우레아, 디메틸 트리메틸 시릴 아민, 트리메틸 시릴 이미다졸 등의 실라잔류, γ-클로로 프로필 트리메톡시 실란, γ-아미노 프로필 트리에톡시 실란, γ-글리시독시 프로필 트리메톡시 실란, γ-메타크릴옥시 프로필 트리메톡시 실란 등의 실란류, 벤조 트리아졸, 벤즈 이미다졸, 인다졸, 이미다졸, 2-메캅토 벤즈 이미다졸, 2-메캅토 벤조 옥사졸, 우라졸, 티오우라실, 메캅토 피리미딘 등의 복소고리식 화합물(複素環式 化合 Specific examples include, for example, trimethylchlorosilane, dimethyl vinyl chlorosilane, chloromethyl dimethyl chloro-chloro-silanes, trimethyl silane, dimethyl diethoxy silane, dimethyl vinyl silanes such as silane, γ- methacryloxypropyl tree silane, diphenyl dimethoxy silane, such as alkoxy silanes, hexamethyldisilazane, N, N'- bis (trimethylsilyl) urea, dimethyl trimethylsilyl amine, trimethylsilyl silanol residues such as imidazole, chloro γ- trimethoxysilane, γ- amino propyl triethoxysilane, γ- glycidoxy trimethoxysilane, γ- methacryloxypropyl trimethoxysilane, etc. silanes, benzotriazole, benzimidazole, indazol of sol, imidazole, 2-methoxy mercaptomethyl benzimidazole, 2-methoxy mercapto benzoxazole, Ura sol, thiouracil, methoxy mercapto flutes heterocyclic compound formula (複 素 環 式 化合 such pyrimidine ), 1,1-디메틸 우레아, 1,3-디메틸우레아 등의 요소화합물,을 들 수 있다. ) It includes a urea compound such as 1,1-dimethyl urea, 1,3-dimethyl urea. 이들 접착 보조제는, 하층막 형성 조성물의 고형분 중에서, 통상 10 질량% 미만, 바람직하게는 5 질량% 미만의 비율로 첨가된다. The adhesion aid is, in the solid content of the lower layer film composition, and usually less than 10% by weight, preferably added at a rate of less than 5% by mass. 본 발명의 하층막 형성 조성물에는, 핀홀이나 스트레이션등의 발생을 억제하고, 또한, 도포성을 향상시키기 위하여, 계면활성제를 첨가할 수 있다. Lower layer film formation composition of the present invention, inhibit the generation of pinholes or the like cast illustration, and further, there can be added a surfactant for improving the coating characteristics. 계면활성제로서는, 예를 들면 폴리 옥시 에틸렌 라우릴 에테르, 폴리 옥시 에틸렌 스테아릴 에테르, 폴리 옥시 에틸렌 올레일 에테르 등의 폴리 옥시 에틸렌 알킬 에테르류, 폴리옥시 에틸렌 옥틸 페놀 에테르, 폴리 옥시 에틸렌 노닐 페놀 에테르 등의 폴리 옥시 에틸렌 알킬 알릴 에테르류, 폴리 옥시 에틸렌?폴리 옥시 프로필렌 블록 코폴리머류, 솔비탄 모노 라우레이트, 솔비탄 모노 팔미테이트, 솔비탄 모노 스테아레이트, 솔비탄 트리 올레이트, 솔비탄 트리 스테아레이트 등의 솔비탄 지방산 에스테르류, 폴리 옥시 에틸렌 솔비탄 모노 라우레이트, 폴리 옥시 에틸렌 솔비탄 모노 팔미테이트, 폴리 옥시 에틸렌 솔비탄 모노 스테아레이트, 폴리 옥시 에틸렌 솔비탄 트리 스테아레이트 등의 폴리 옥시 에틸렌 솔비탄 지방산 에스테르류 등의 논이온계 As the surfactant, such as polyoxyethylene lauryl ether, polyoxyethylene stearyl ether, polyoxyethylene oleyl ether and polyoxyethylene alkyl ethers, polyoxyethylene octylphenol ether, polyoxyethylene nonylphenol ether, etc. of polyoxyethylene alkyl allyl ethers, polyoxyethylene? polyoxypropylene block copolymers, sorbitan monolaurate, sorbitan monopalmitate, sorbitan monostearate, sorbitan trioleate, sorbitan tristearate sorbitan fatty acid esters such as polyoxyethylene sorbitan monolaurate, polyoxyethylene sorbitan monopalmitate, polyoxyethylene sorbitan monostearate, polyoxyethylene, polyoxyethylene sorbitan, such as sorbitan tristearate non-ionic, such as fatty acid ester-based 면활성제, 상품명 에프탑 EF301, EF303, EF352((주) 토켐 프로닥츠 제품), 상품명 메가팩 F171, F173, R-08, R-30 (다이닛뽄 잉키 (주) 제품), 후로라도 FC430, FC431 (스미토모 스리엠 (주) 제품), 상품명 아사히가드 AG710, 사프론 S-382, SC101, SC102, SC103, SC104, SC105, SC106(욱초자(旭硝子) (주) 제품) 등의 불소계 계면활성제, 오르가노 실록산 폴리머 KP-341(신에츠 화학공업 (주) 제품) 등을 들 수 있다. Surface active agent, trade name: F-Top EF301, EF303, EF352 (Co. tokem Pro dakcheu, Ltd.), trade name: Megafac F171, F173, R-08, R-30 (Dai Nippon ingki Co. product), since any FC430, FC431 (manufactured by Sumitomo Three M Co., Ltd.), trade name: Asahi guard AG710, Saffron S-382, SC101, SC102, SC103, SC104, SC105, SC106 (Wook Glass (旭硝子) Co., Ltd.) a fluorine-containing surfactant, climb, such as Kano siloxane polymer and the like KP-341 (Shin-Etsu chemical Co., Ltd.). 이들 계면활성제의 첨가량은, 하층막 형성조성물의 고형분 중에, 통상 0.5 질량% 이하, 바람직하게는 0.2 질량% 이하이다. The addition amount of these surfactants, is the solid content of the underlayer film forming composition, generally 0.5% by mass or less, preferably 0.2 mass% or less. 이들 계면활성제는 단독으로 첨가하여도 좋고, 또한 2종이상을 조합시켜 첨가할 수도 있다. These surfactants may be added alone, or may be added in combination of two or more. 이하, 본 발명의 하층막 형성 조성물의 사용에 관하여 설명한다. Hereinafter, a description is given of the use of the lower layer film composition of the present invention. 반도체에 사용되는 기판(예를 들면, 실리콘/이산화 실리콘 피복기판, 실리콘 나이트라이드 기판, 글래스 기판, ITO 기판, 폴리 이미드 기판, 저유전율 재료(low-k 재료) 피복 기판등)의 위에, 스피너, 코터 등의 적당한 도포 방법에 의해 본 발명의 하층막 형성 조성물이 도포되고, 그 후, 가열함으로써 다공질 하층막이 형성된다. The substrate used in the semiconductor (e.g., silicon / silicon dioxide coated substrates, silicon nitride substrates, glass substrates, ITO substrates, polyimide substrates, low dielectric constant material (low-k material) coated substrates, etc.) on top of, spinner , the lower layer film composition of the present invention is applied by a suitable coating method such as a coater, and thereafter, the porous lower layer film is formed by heating. 가열하는 조건으로는, 가열온도 60℃~250℃, 가열시간 0.5~60분사이 중에서 적의, 선택된다. Under the conditions of heating, the enemy is, selected from a heating temperature between 60 ℃ ~ 250 ℃, the heating time of 0.5 to 60 minutes. 이것에 의해, 균일한 공공을 가지는 다공질 하층막이 형성된다. Thus, the film is formed the porous lower layer having a uniform public. 이어서, 그 다공질 하층막 위에, 포토 레지스트 층이 형성되고, 그 후, 미리 설정된 마스크를 통하여 노광시키고, 알칼리성 수용액 등의 현상액에 의해 현상되어, 패턴화된 포토 레지스트가 형성된다. Then, the porous lower layer film on the photoresist layer is formed, and then is exposed via a predetermined mask, and is developed by a developing solution such as an aqueous alkaline solution, to form the patterned photoresist. 또한, 필요에 따라 노광후 가열(PEB : Post Exposure Bake)을 행할 수도 있다. Furthermore, post-exposure heating as necessary: ​​may be performed (Post Exposure Bake PEB). 다공질 하층막 위에 형성된 포토 레지스트로서는 특별한 제한은 없고, 범용되고 있는 네가티브형 포토레지스트, 포지티브형 포토레지스트 중 어느것도 사용가능하다. As the photoresist film formed on the porous lower layer has no particular limitation it can be used any of not, and a general purpose negative type photoresist, a positive photoresist, which also. 그 후, 포토레지스트가 제거된 부분의 다공질 하층막이 에칭에 의해 제거되고, 반도체 기판을 부분적으로 노출시킨다. Then, the photoresist is removed portion of the porous lower layer film is removed by etching, thereby partially expose the semiconductor substrate. 에칭은, 상기 테트라 플루오로 메탄, 퍼 플루오로 시클로 부탄 등을 이용하여 행해진다. Etching is carried out using a cyclobutane such as the tetra-fluoro-methane, the buffer acid. 본 발명에서는, 하층막이 다공질 하층막이기 때문에, 그 에칭에 의한 제거는 다공질이 아닌 하층막에 비하여, 단시간에 완료할 수 있다. In the present invention, since the lower layer film is a porous lower layer film, removed by the etching may be completed in a shorter time than the lower layer film non-porous. 그 결과, 포토 레지스트의 막두께 감소량을 억제할 수 있다. As a result, it is possible to inhibit the thickness decrease amount of the photoresist. 이것에 의해, 반도체 기판의 가공시에 보호막으로 사용되는 패턴화된 포토 레지스트 및 하층막을 형성할 수 있다. To this, it is possible to form a protective film during processing of the semiconductor substrate the patterned photoresist film and the lower layer that is used by. 드라이 에칭에 의한 제거는, 그 제거되는 층에 포함되는 방향 고리 구조의 비율이 커질수록 그 속도가 작게 된다고 알려져 있다. Removed by dry etching, the larger the proportion of the aromatic ring structure is contained in the layer to be removed is known that the smaller the speed. 그 때문에, 본 발명의 다공질 하층막에서는, 그 드라이 에칭에 의한 제거 속도를 보다 크게 하고 싶은 경우에는, 사용되는 하층막 형성 조성물에 포함되는 방향 고리 구조의 양을 적게 하면 좋다. Thus, the porous lower layer film of the present invention, in the case larger than the removal rate by the dry etching and the like, may be less the amount of aromatic ring structure contained in the lower layer film composition to be used. 특히, 그 조성물 중의 발포성기를 가지는 폴리머 성분 또는 폴리머 성분에 포함되는 방향 고리 구조의 양을 적게 하면 좋다. In particular, it may be less the amount of the aromatic ring structure contained in the polymer component or the polymer component having a group of the foamable composition. 따라서, 드라이 에칭에 의한 제거속도가 큰 다공질 하층막이 요구되는 경우에는, 그 구조내에 방향 고리 구조를 가지지 않는 발포성기를 가지는 폴리머 성분 또는 폴리머가 바람직하게 이용된다. Therefore, when the removal rate of the porous lower layer is required a large film by dry etching, the polymer component or the polymer is preferably used having an expandable structure that does not have an aromatic ring in its structure. 포지티브형 포토 레지스트의 현상액으로는, 수산화 나트륨, 수산화 칼륨, 탄산 나트륨, 규산 나트륨, 메타 규산 나트륨, 암모니아 수 등의 무기 알칼리류, 에틸 아민, n-프로필 아민 등의 제1 아민류, 디에틸 아민, 디-n-부틸 아민 등의 제2 아민류, 트리에틸 아민, 메틸 디에틸 아민 등의 제3 아민류, 디메틸 에탄올 아민, 트리에탄올 아민 등의 알콜 아민류, 테트라 메틸 암모늄 히드록시드, 테트라 에틸 암모늄 히드록시드, 콜린 등의 제4급 암모늄염, 피롤, 피페리딘 등의 환상 아민류, 등의 알칼리 류의 수용액을 사용할 수 있다. A developer of the positive photoresist, sodium hydroxide, potassium hydroxide, first amines, di such as inorganic alkalis, ethylamine, n- propylamine, such as sodium carbonate, sodium silicate, sodium metasilicate, ammonia ethylamine, di -n- butylamine, etc. of the second amine, triethyl amine, methyl diethyl amine and so on of the third amine, dimethylethanolamine, triethanolamine, etc. of alcohol amines, tetramethylammonium hydroxide, tetraethylammonium hydroxide It can be used a quaternary ammonium salt in an aqueous solution of alkali, pyrrole, piperidine and so on of the cyclic amines, such as choline. 또한, 상기 알칼리류의 수용액에 이소 프로필 알콜 등의 알콜류, 아니온계 등의 계면활성제를 적당량 첨가하여 사용할 수도 있다. Also may be used in an appropriate amount of surface active agents such as alcohols, no ongye such as isopropyl alcohol was added to the aqueous solution of the alkali. 이들 중에서 바람직한 현상액은 제4급 암모늄염, 더욱 바람직하게는 테트라 메틸 암모늄 히드록시드 및 콜린이다. Preferred developer among them is that the quaternary ammonium salts, more preferably tetramethylammonium hydroxide and choline. 또한, 본 발명의 다공질 하층막의 상층에는, 포토 레지스트의 도포, 형성전에 반사 방지막층이 도포, 형성되는 경우가 있다. Further, the porous lower layer an upper layer film of the present invention, there is a case the anti-reflection film layer is applied, which is formed prior to application of the photoresist, forming. 여기서 사용되는 반사 방지막 조성물로는 특별한 제한은 없고, 지금까지 리소그라피 프로세스에서 관용되고 있는 것 중에서 임으로 선택하여 사용할 수 있으며, 또한, 관용되고 있는 방법, 예를 들면, 스피너, 코터에 의한 도포 및 소성에 의해 반사 방지막의 형성을 행할 수 있다. A reflective film composition There is no particular limitation as used herein, may be selected arbitrarily from among those that are tolerant in lithography processes so far, also, how and tolerance, for example, coated and baked by the spinner, coater It can be carried out by the formation of an antireflection film. 반사 방지막 조성물로는, 예를 들면, 흡광성 화합물, 수지 및 용제를 주성분으로 하는 것, 화학결합에 의해 연결한 흡광성기를 가지는 수지, 가교제 및 용제를 주성분으로 하는 것, 흡광성 화합물, 가교제 및 용제를 주성분으로 하는 것, 흡광성을 가지는 고분자 가교제 및 용제를 주성분으로 하는 것, 등을 들 수 있다. A reflective film composition include, for example, that mainly composed of absorbing light blocking compound, a resin and a solvent, to the main component a resin, a crosslinking agent and a solvent having a light absorbing group linked by a chemical bond, absorbing light blocking compound, a crosslinking agent and to the solvent as a main component, to cross-linking agent and a solvent as a main component a polymer having a light-absorbing, and the like. 이들 반사 방지막 조성물은 또한, 필요에 따라, 산성분, 산발생제 성분, 레올로지 조정제 등을 포함할 수 있다. The anti-reflective coating composition also may include, as needed, acid, acid-generating agent component, rheology modifiers and the like. 흡광성 화합물로서는, 반사 방지막의 위에 설치한 포토 레지스트 중의 감광성분의 감광특성 파장 영역에서의 빛에 대하여 높은 흡수능을 가지는 것이면 이용할 수 있고, 예를 들면, 벤조 페논 화합물, 벤조 트리아졸 화합물, 아조 화합물, 나프탈렌 화합물, 안트라센 화합물, 안트라키논 화합물, 트리아진 화합물 등을 들 수 있다. As the intake light component compound, it can be used as long as it has a high absorption capacity to light in a photosensitive characteristic wavelength region of photosensitive components in a photoresist provided on the anti-reflection film, for example, benzophenone compounds, benzotriazole compounds, azo compounds , there may be mentioned naphthalene compounds, anthracene compounds, anthraquinone kinon compounds, triazine compounds, and the like. 수지로서는, 폴리에스테르, 폴리이미드, 폴리스티렌, 노보락 수지, 폴리아세탈 수지, 아크릴 수지 등을 들 수 있다. As the resin, there may be mentioned polyesters, polyimides, polystyrenes, novolak resins, polyacetal resins, acrylic resins, and the like. 화학결합에 의해 연결한 흡광성기를 가지는 수지로서는, 안트라센 고리, 나프탈렌 고리, 벤젠 고리, 키노린 고리, 키녹사린 고리, 티아졸 고리라는 흡광성 방향 고리 구조를 가지는 수지를 들 수 있다. As the resin having a light absorbing group linked by a chemical bond, there may be mentioned a resin having an anthracene ring, naphthalene ring, benzene ring, aimed key ring, the key noksa Lin ring, thiazole ring of light-absorbing aromatic ring structure. 본 발명의 하층막 형성 조성물로 형성되는 다공질 하층막은, 또한, 리소그라피 프로세스에 사용되는 빛의 파장에 의해서는, 그 빛을 흡수하는 것이 있고, 그러한 경우에는, 기판부터의 반사광을 방지하는 효과를 가지는 층으로 기능할 수 있다. Film porous lower layer is formed of a lower layer of the present invention the film-forming composition, also, by the wavelength of light used in the lithography process, and to absorb the light, and such cases, having the effect of preventing the reflected light from the substrate It may serve as a layer. 또한, 본 발명의 다공질 하층막은, 기판과 포토 레지스트의 상호작용을 방지하기 위한 층, 포토 레지스트에 이용되는 재료 또는 포토 레지스트의 노광시에 생성하는 물질의 기판으로의 나쁜 작용을 방지하는 기능을 가지는 층, 가열시에 기판에서부터 생성하는 물질의 상층 포토 레지스트로의 확산, 나쁜 작용을 방지하는 기능을 가지는 층, 으로 작용하는 것도 가능하다. Further, the film porous lower layer of the present invention, a function for preventing the bad effect of the substrate and a layer for preventing an interaction with the photoresist, of the material produced during exposure of the material or a photoresist is used in the photoresist substrate layer, it is also possible to diffusion, serves as a layer, having a function of preventing a bad effect to the upper layer of photoresist material to generate from the substrate upon heating. 이하, 본 발명을 실시예에 의해 보다 구체적으로 설명하지만, 이것에 의해 본 발명이 한정되는 것은 아니다. Or less, more specifically described by the present invention to the Examples, but the present invention is not limited by this. 프로필렌 글리콜 모노 메틸 에테르 27.91g에, 2-히드록시 프로필렌 메타크릴레이트 20.93g과 벤질 메타크릴레이트 6.98g을 용해시키고, 반응액 중에 질소를 30분 흘린 후, 70℃로 승온하였다. Propylene glycol monomethyl ether 27.91g, 2- hydroxyethyl methacrylate, 20.93g propylene and benzyl meth then tipped nitrogen for 30 minutes during methacrylate was dissolved 6.98g, reaction solution, and the mixture was heated up to 70 ℃. 반응용액을 70℃에 유지하면서 아조 비스 이소 부틸로 니트릴 0.3g을 첨가하고, 질소분위기하, 70℃에서 24시간 교반함으로써, 2-히드록시 프로필 메타크릴레이트와 벤질 메타크릴레이트의 공중합 폴리머의 용액을 얻었다. By keeping the reaction solution was added to the nitrile 70 ℃ 0.3g as azobisisobutyronitrile, and an atmosphere of nitrogen, stirred for 24 hours at 70 ℃, a solution of copolymer of 2-hydroxypropyl methacrylate and benzyl methacrylate It was obtained. 얻어진 폴리머의 GPC 분석을 행할 때, 중량평균분자량은 15000(표준 폴리스티렌 환산)이었다. When performing the GPC analysis of the obtained polymer, the weight average molecular weight was 15,000 (in terms of standard polystyrene). 젖산 에틸 30g에, 2-히드록시 에틸 아크릴레이트 30g을 용해시키고, 반응액 중에 질소를 30분 흘린 후, 70℃로 승온하였다. After tipped nitrogen for 30 minutes in the ethyl lactate 30g, was dissolved in 30g of 2-hydroxyethyl acrylate, the reaction solution, and the mixture was heated up to 70 ℃. 반응용액을 70℃에 유지하면서 아조 비스 이소 부틸로 니트릴 0.3g을 첨가하고, 질소분위기하, 70℃에서 24시간 교반함으로써, 폴리(2-히드록시 에틸)아크릴레이트의 용액을 얻었다. While maintaining the reaction solution was added to the nitrile 70 ℃ 0.3g as azobisisobutyronitrile, and under nitrogen atmosphere, at 70 ℃ by stirring for 24 hours, the poly (2-hydroxyethyl) to obtain a solution of the acrylate. 얻어진 폴리머의 GPC분석을 행하였을 때, 중량평균분자량은 9800(표준 폴리스티렌 환산)이었다. When done the GPC analysis of the obtained polymer, the weight average molecular weight was 9800 (in terms of standard polystyrene). 합성례1에서 얻은 폴리머 5g을 포함하는 용액 10g에, 헥사 메톡시 메틸 멜라민 1.15g, 피리디늄-p-톨루엔 술폰산 0.012g, 프로필렌 글리콜 모노 메틸 에테르 0.77g 및 디메틸 술폭시드 8.66g을 첨가하고, 30.0% 용액으로 한 후, 발포제 4,4-옥시 비스 벤젠 술포닐 히드라지드 0.309g(고형분 중 5%)를 첨가하였다. To a solution containing 10g 5g of the polymer obtained in Synthesis Example 1, was added to 1.15g of hexamethoxymethylmelamine, pyridinium toluenesulfonate -p- 0.012g, propylene glycol monomethyl ether 0.77g and 8.66g of dimethyl sulfoxide, and 30.0 after the% solution, a foaming agent 4,4-oxybis benzene sulfonyl hydrazide 0.309g (5% of the solid content) was added. 그리고, 공공 직경 0.2㎛인 폴리에틸렌제 마이크로필터를 이용하여 여과하여, 하층막 형성 조성물 용액을 제조하였다. Then, the filtered through a public diameter 0.2㎛ a polyethylene microfilter to prepare a lower layer film-forming composition solution. 합성례1에서 얻은 폴리머 5g을 포함하는 용액 10g에, 헥사 메톡시 메틸 멜라민 1.15g, 피리디늄-p-톨루엔 술폰산 0.012g, 프로필렌 글리콜 모노 메틸 에테르 0.77g, 및 디메틸 술폭시드 8.66g을 첨가하고, 30.0% 용액으로 한 후, 발포제 아조 디카본 아미드 0.124g(전고형분 중 2%)를 첨가하였다. To a solution containing 10g 5g of the polymer obtained in Synthesis Example 1, it was added to 1.15g of hexamethoxymethylmelamine, pyridinium toluenesulfonate -p- 0.012g, propylene glycol monomethyl ether 0.77g, 8.66g and dimethyl sulfoxide, and after a 30.0% solution was added (2% of total solids), the blowing agent azodicarbonamide 0.124g. 그리고, 공공 직경 0.2㎛인 폴리에틸렌제 마이크로필터를 이용하여 여과하여, 하층막 형성 조성물의 용액을 제조하였다. Then, the filtered through a public diameter 0.2㎛ a polyethylene micro-filter, to prepare a solution of the lower layer film composition. 합성례2에서 얻은 폴리머 5g을 포함하는 용액 10g에, 헥사메톡시 메틸 멜라민 1.15g, 피리디늄-p-톨루엔 술폰산 0.012g, 프로필렌 글리콜 모노 메틸 에테르 0.77g, 및 디메틸 술폭시드 8.66g을 첨가하여, 30.0% 용액으로 한 후, 발포제 아조 디카본 아미드 0.124(전고형분 중 2%)를 첨가하였다. To a solution containing 10g 5g of the polymer obtained in Synthesis Example 2, and the hexamethoxymethylmelamine 1.15g, pyridinium toluenesulfonate -p- 0.012g, propylene glycol monomethyl ether 0.77g, 8.66g and dimethyl sulfoxide is added, after a 30.0% solution was added (2% of total solids), the blowing agent azodicarbonamide 0.124. 그리고, 공공직경 0.2㎛인 폴리에틸렌제 마이크로필터를 이용하여 여과하여, 하층막 형성 조성물의 용액을 제조하였다. Then, the filtered through a public diameter 0.2㎛ a polyethylene micro-filter, to prepare a solution of the lower layer film composition. 합성례1에서 얻은 폴리머 5g을 포함하는 용액 10g에, 헥사 메톡시 메틸 멜라민 1.15g, 피리디늄-p-톨루엔 술폰산 0.012g, 프로필렌 글리콜 모노 메틸 에테르 0.77g, 및 디메틸 술폭시드 8.66g을 첨가하여, 30.0% 용액으로 하였다. To a solution containing 10g 5g of the polymer obtained in Synthesis Example 1, and the hexamethoxymethylmelamine 1.15g, pyridinium toluenesulfonate -p- 0.012g, propylene glycol monomethyl ether 0.77g, 8.66g and dimethyl sulfoxide is added, It was a 30.0% solution. 그리고, 공공 직경 0.05㎛인 폴리에틸렌제 마이크로필터를 이용하여 여과하여, 발포제를 포함하지 않는 하층막 형성 조성물의 용액을 제조하였다. Then, the public 0.05㎛ diameter of the polyethylene was filtered using a micro-filter, to prepare a lower layer solution of the film-forming composition does not contain a blowing agent. 합성례2에서 얻은 폴리머 5g을 포함하는 용액 10g에, 헥사 메톡시 메틸 멜라민 1.15g, 피리디늄-p-톨루엔 술폰산 0.012g, 프로필렌 글리콜 모노 메틸 에테르 0.77g, 및 디메틸 술폭시드 8.66g을 첨가하여, 30.0% 용액으로 하였다. To a solution containing 10g 5g of the polymer obtained in Synthesis Example 2, and the hexamethoxymethylmelamine 1.15g, pyridinium toluenesulfonate -p- 0.012g, propylene glycol monomethyl ether 0.77g, 8.66g and dimethyl sulfoxide is added, It was a 30.0% solution. 그리고, 공공 직경 0.05㎛인 폴리에틸렌제 마이크로필터를 이용하여 여과하여, 발포제를 포함 하지 않는 하층막 형성 조성물의 용액을 제조하였다. Then, the public 0.05㎛ diameter of the polyethylene was filtered using a micro-filter, to prepare a lower layer solution of the film-forming composition does not contain a blowing agent. 실시예1~3에서 얻은 하층막 형성 조성물의 용액을 스피너에 의해, 실리콘 웨이퍼 위에 도포하였다. Performed by a lower layer solution of the film-forming compositions obtained in Examples 1 to 3 in the spinner, was coated on a silicon wafer. 핫 플레이트 위에서 205℃ 5분간 가열하여, 다공질 하층막(막두께 0.22㎛)을 형성하였다. By heating 205 ℃ 5 bungan on a hot plate to form a porous lower layer film (film thickness 0.22㎛). 이 다공질 하층막을 포토 레지스트에 사용하는 용제, 예를 들면 젖산 에틸, 및 프로필렌 글리콜 모노 메틸 에테르에 침적하여, 그 용제에 녹지 않는 것을 확인하였다. The lower layer and the porous film, for the solvent, examples of using a photoresist deposited in the ethyl lactate, and propylene glycol monomethyl ether, was confirmed to be insoluble in the solvent. 실시예1~3에서 얻은 하층막 형성 조성물의 용액을 스피너에 의해, 실리콘 웨이퍼 위에 도포하였다. Performed by a lower layer solution of the film-forming compositions obtained in Examples 1 to 3 in the spinner, was coated on a silicon wafer. 핫 플레이트 위에서 205℃ 5분간 가열하여, 다공질 하층막(막두께 0.50㎛)을 형성하였다. By heating 205 ℃ 5 bungan on a hot plate to form a porous lower layer film (film thickness 0.50㎛). 이 다공질 하층막의 상층에, 시판되는 포토 레지스트 용액(시프레사 제조, 상품명 APEX-E 등)을 스피너에 의해 도포하였다. On the porous lower layer film is the upper layer, the photoresist solution of commercially available (sipeure Co., Ltd., trade name: APEX-E like) was applied by a spinner. 핫 플레이트 위에서 90℃ 1분간 가열하고, 포토 레지스트를 노광후, 노광후 가열을 90℃ 1.5분간 행하였다. Heating 90 ℃ 1 bungan on a hot plate and, after the photoresist exposure, heating after exposure were subjected to 90 ℃ 1.5 minutes. 포토 레지스트를 현상시킨 후, 다공질 하층막의 막두께를 측정하여, 실시예 1~3에서 얻은 다공질 하층막과 포토 레지스트의 인터 믹싱이 일어나지 않는 것을 확인하였다. After developing the photoresist, it was confirmed that the porous lower layer by measuring the film thickness in Example 1-3 a porous lower layer intermixing of the photoresist film and does not occur in the obtained. 실시예1~3, 및 비교예1,2에서 얻은 하층막 형성조성물의 용액을 스피너에 의해 실리콘 웨이퍼 위에 도포하였다. Example 1 The lower layer solution of the film forming composition obtained in 1-3, and Comparative Examples 1 and 2 was coated on a silicon wafer by a spinner. 핫 플레이트 위에서 205℃ 5분간 가열하고, 다공질 하층막(실시예1~3) 및 비다공질 하층막(비교예1,2)(각각 막두께 0.22㎛)을 형성하였다. Heating 205 ℃ 5 bungan on a hot plate, followed by forming the porous lower layer film (Example 1-3) and a non-porous lower layer film (Comparative Examples 1,2) (each film thickness 0.22㎛). 또한, 시판되는 포토 레지스트 용액(스미토모 화학공업(주) 제조, 상품명 PAR710)을 스피너에 의해 실리콘 웨이퍼 위에 도포하였다. Furthermore, it was coated on a silicon wafer by a commercially available photoresist solution (manufactured by Sumitomo Chemical Industry Co., Ltd., trade name: PAR710) to the spinner. 핫 플레이트 위에서 120℃ 1분간 가열하고, 포토 레지스트(막두께 0.35㎛)을 형성하였다. Heating 120 ℃ 1 bungan on a hot plate, followed by forming a photoresist (film thickness 0.35㎛). 그리고 이들을, 일본 사이언티픽제 RIE 시스템 ES401을 이용하고, 드라이에칭 가스로 CF 4 를 사용한 조건하에서 드라이에칭 속도를 측정하였다. And these, Japan Scientific tea pikje the dry etching rate was measured under the condition using RIE system ES401, and using CF 4 as a dry etching gas. 결과를 표 1에 나타내었다. The results are shown in Table 1. 드라이에칭 선택성은, 포토 레지스트의 드라이에칭 속도를 1.00으로 한 때의, 하층막의 드라이 에칭 속도를 나타낸 것이다. The dry etching selectivity is, when the dry etching rate of the photoresist with 1.00, illustrating the lower layer film is dry-etching rate. 또한, 표 중, A1은 2-히드록시 프로필 메타크릴레이트와 벤질 메타크릴레이트의 공중합 폴리머, A2는 폴리(2-히드록시 에틸)아크릴레이트, B1은 4,4-옥시비스벤젠술포닐 히드라지드, B2는 아조 디카본 아미드를 나타낸다. In addition, the table of the, A1 is 2-hydroxypropyl methacrylate and a copolymer of benzyl methacrylate, A2 are poly (2-hydroxyethyl) acrylate, B1 is 4,4-oxybis benzene sulfonyl hydrazide , B2 represents an azodicarbonamide. 폴리머 A1의 하층막에 대해서 비교하면, 실시예1,2의 하층막 형성 조성물로부터 얻어진 다공질 하층막의 에칭 속도는, 비교예 1의 비다공질 하층막에 비하여 큰 것이 확인되었다. Compared with respect to the polymer A1 lower layer film, the lower layer film embodiment, the porous underlayer film forming composition of the etching rate obtained from 1 and 2, it was confirmed to be large as compared with Comparative Example 1, a non-porous lower layer of the film. 또한, 폴리머 A2의 하층막에 관하여 비교하면, 실시예3의 하층막 형성조성물로부터 얻어진 다공질 하층막의 에칭 속도는, 비교예2의 비다공질 하층막에 비하여 크다는 것이 확인되었다. In addition, in comparison with respect to polymer A2 of the lower layer film, the third embodiment the lower layer film porous underlayer film forming composition of the etching rate obtained from, has been confirmed to be larger than a comparable non-porous lower layer of the Example 2 membrane. 폴리머의 종류에 의존하지 않고, 발포제를 도입함으로써, 큰 에칭 속도를 가지는 다공질 하층막이 얻어짐이 명확하게 되었다. Without depending on the type of polymer, by introducing a blowing agent, the porous lower layer film is obtained having a large etching rate was luggage clear. 다공질 하층막의 드라이에칭속도가 포토 레지스트의 드라이에칭 속도보다도 높은 것의 필요성은, 하층막에 형성되는 포토 레지스트를 현상하고, 그 후에 드라이 에칭에 의해 기판의 하지(下地)를 노출시키는 공정에서, 다공질 하층막의 드라이 에칭 속도 쪽이 포토 레지스트의 드라이 에칭 속도 보다도 높게 됨으로써, 포토 레지스트가 잘려 없어지기 전에 다공질 하층막이 제거되는 것으로, 현상된 포토 레지스트의 패턴을 정확하게 기판에 전사할 수 있기 때문이다. Necessity of what the porous lower layer film is dry etching rate is higher than the dry etching rate of the photoresist, in the step of developing the photoresist formed on the lower layer film, and then exposing to (下地) of the substrate by dry etching, the porous lower layer film, because by being dry etching rate side is higher than the dry etching rate of the photoresist, the photoresist is to be removed before the film is porous lower layer can not cut, can be accurately transferred to the substrate the patterns of the developed photoresist. 반도체장치의 제조에 사용되는 다공질 하층막을 형성하기 위한 하층막 형성 조성물. Lower layer film formation composition for forming a porous lower layer film used in the manufacture of semiconductor devices. 제4항 또는 제6항에 있어서, 상기 폴리머가, 벤젠 고리, 나프탈렌 고리, 안트라센 고리 및 트리아진 고리로 이루어지는 군에서 선택되는 적어도 하나의 방향(芳香) 고리 구조를 가지는 것인 하층막 형성 조성물. Claim 4 or according to claim 6, wherein said polymer is a benzene ring, naphthalene ring, anthracene ring, and the triazine at least one direction selected from the group consisting of the ring (芳香) of the lower layer film forming composition having a ring structure. 제4항 또는 제6항에 있어서, 상기 가교성 화합물이, 적어도 2개의 가교형성 치환기를 가지는 것인 하층막 형성 조성물. Claim 4 or according to claim 6, wherein the crosslinkable compound is at least 2 of the lower layer film-forming composition that has a substituent of crosslinking. 제4항 또는 제6항에 있어서, 상기 흡광성 화합물이, 벤젠 고리, 나프탈렌 고리, 안트라센 고리 및 트리아진 트리온 고리로 이루어진 군에서 선택된 적어도 하나의 고리 구조를 가지는 것인 하층막 형성 조성물. Claim 4 or according to claim 6, wherein the light-absorbing compound is a benzene ring, naphthalene ring, anthracene ring, and a triazine-tree of a lower layer film-forming composition having at least one ring structure selected from the group consisting of a whole ring. 제4항 내지 제6항 중 어느 한 항에 기재된 하층막 형성 조성물을 기판 위에 도포하고, 가열하여 다공질 하층막을 형성하는 공정, 이 다공질 하층막 위에 포토 레지스트의 층을 형성하는 공정, 상기 다공질 하층막과 상기 포토 레지스트로 피복된 반도체 기판을 노광하는 공정, 상기 노광후에 상기 포토 레지스트를 현상하는 공정, 및 상기 포토 레지스트가 현상 제거되는 부분의 다공질 하층막을 에칭에 의해 제거하는 공정을 포함하는, 반도체 장치의 제조에 이용되는 포토 레지스트 패턴의 형성방법. Of claim 4 to claim 6 applied on a substrate a lower layer film composition according to any one of items, and heated by the porous lower layer step, the porous lower layer film on the step of forming a layer of photoresist, said porous to form a film lower layer film and a semiconductor device and the photoresist after the process, wherein the exposure for exposing the semiconductor substrate coated with a step of removal by the process, and etching the porous lower layer film of the portion in which the photoresist is removed developer for developing the photoresist the method of forming a photoresist pattern for use in the production of.